Easy and quick Lemon Garlic Shrimp recipe is ready in flat 20 minutes. Toss in your favourite pasta like fettuccine and your Creamy Lemon Garlic Shrimp Pasta is on the table in no time. 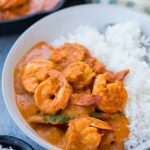 The sauce is creamy, smooth and has a refreshing lemon flavour. The awesome thing about this dish is, all of it can done in one pan. There are times my husband returns from work, dreaming about a restaurant-style dinner to be served. When he finds the usual Roti(Indian Bread) and Curry on the table, his disappointment can be clearly seen. Though he never complains, I can clearly make out. 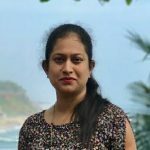 As if coming up with a dinner idea was not enough, there is also demand for something new every week. So experimenting with new recipes never ends for me. But at the end, when I see happy faces after dinner, all this effort seems worth. 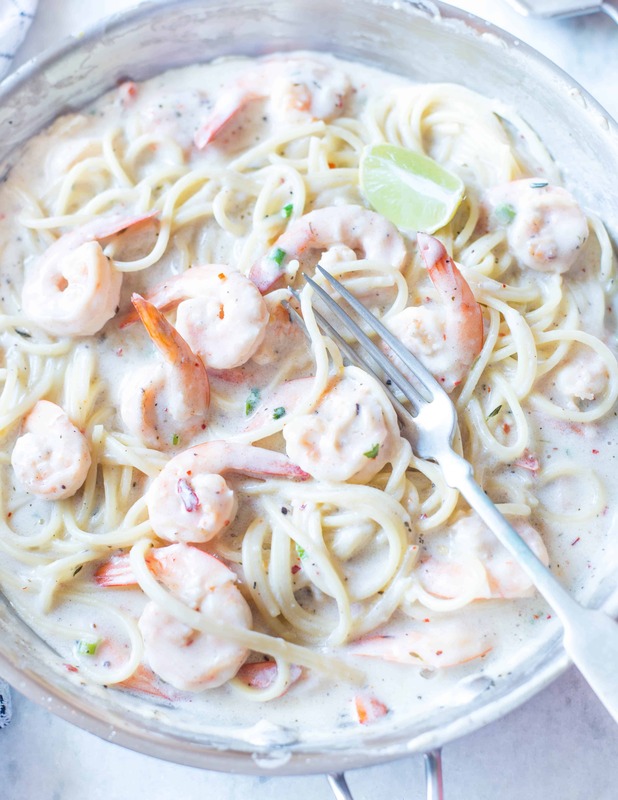 This Creamy Lemon Garlic Shrimp Pasta is exactly the kind of meal you would order in a fancy restaurant. Shrimp is tossed in incredible creamy Lemon garlic sauce and served along with your favourite pasta. The only difference is you don’t have to pay a bomb and You can have this in your PJs on your couch. Are you a Shrimp Lover or Hater? I absolutely love Shrimp, so is my Husband. 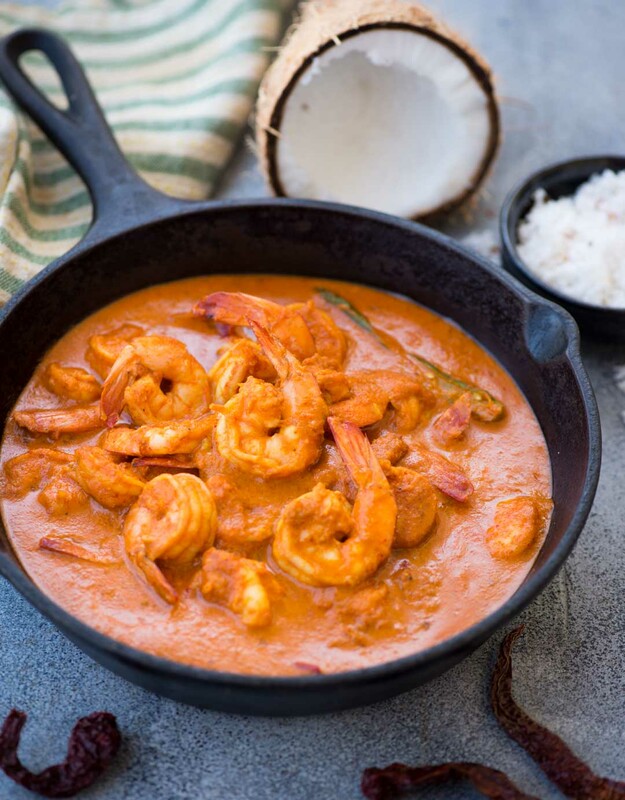 Humble Indian Curry like this Goan Prawn Curry to this quick Garlic Butter Shrimp and Vegetable Skillet, we love anything with Shrimp. 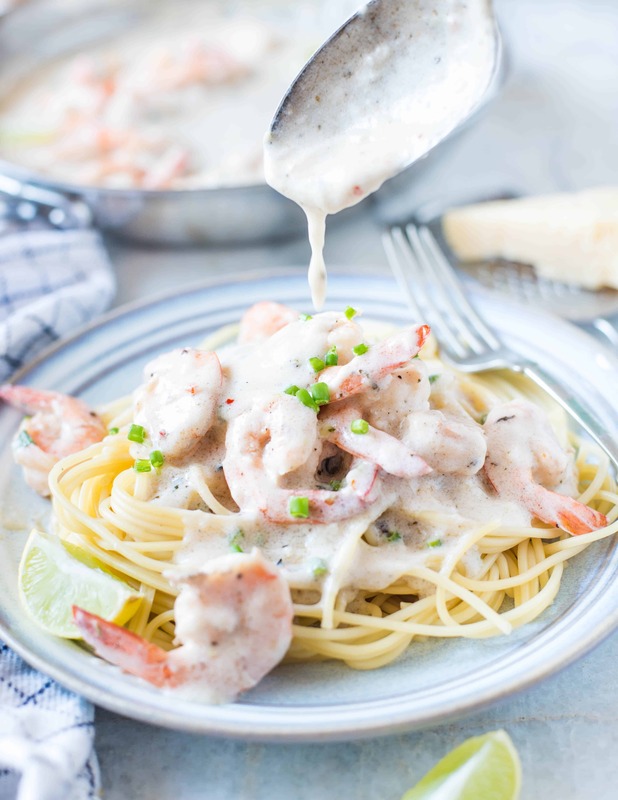 The process of making this Creamy Lemon Garlic Shrimp Pasta is fairly simple and easy. It doesn’t call for any fancy ingredients. Bring a big pot of water to a boil. Lightly season with salt. Cook pasta as per package instruction. Start with Sauting shrimps in butter and garlic. Once the prawn turns pink remove from the pan. Don’t overcook shrimp in this step, else they will turn rubbery. In the same pan add butter, before it starts to brown add flour. Mix well. Let it cook for about 30 seconds. Add chicken stock. Mix until there are no lumps. the sauce will start to thicken. Add cream. followed by Italian seasoning. When the sauce starts to thicken add lemon juice and season with salt and pepper. Serve the Creamy Lemon Garlic Shrimp on your favourite Pasta. 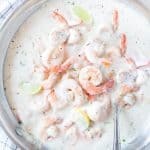 CAN I USE FROZEN SHRIMP? While I have always used fresh shrimp, I don’t see any issue with frozen shrimp. 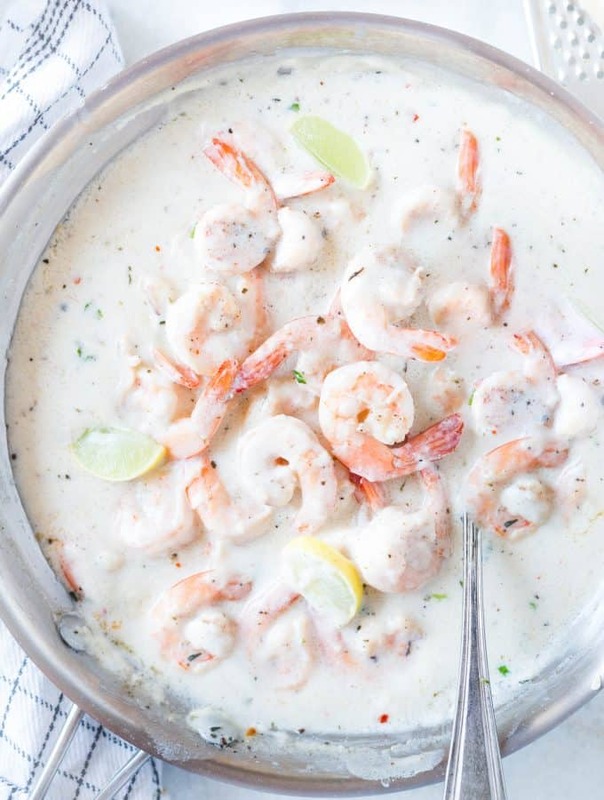 Once thawed, you can absolutely use Frozen Shrimp. 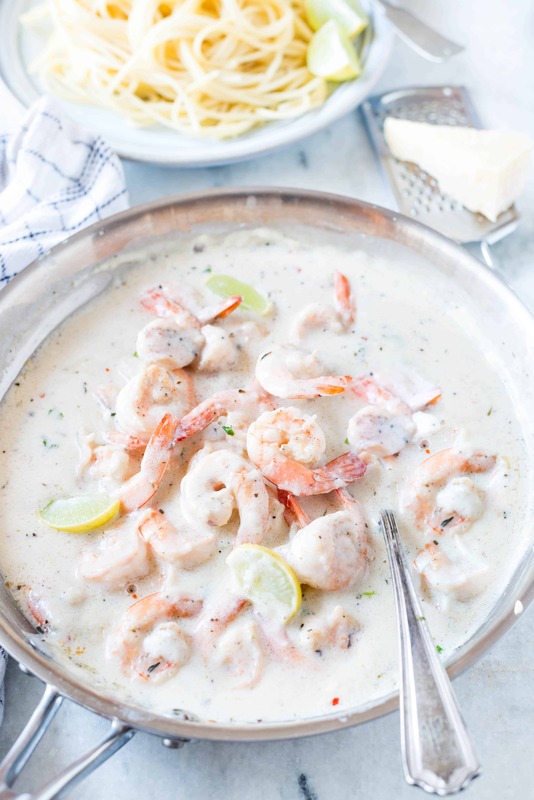 Quick and easy Lemon Garlic Shrimp in creamy buttery Parmesan sauce. Ready in 30 minutes. In a pan add Olive oil. 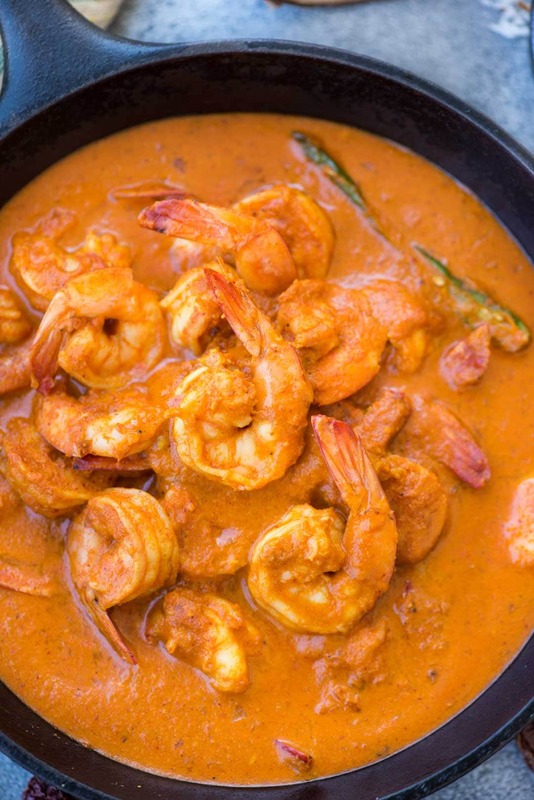 Once medium hot add shrimp(in two batches) to the pan in a single layer. Cook for 1-2 minutes each side till light brown in color. To the same pan add butter. Few drops of oil. When butter starts to foam, add minced garlic. Sit for a couple of seconds. Add all purpose flour. Stir till it looks light golden brown in color and the raw smell is gone. Lower the flame. Slowly add warm chicken stock ,stirring continuously with other hand. Stir till there is no lumps. Slowly add heavy cream followed by Parmesan cheese. Add onion powder and Italian seasoning. (If you find the sauce too thick add 1/2 cup warm chicken stock). Add salt and pepper. Add cooked shrimp. Mix everything well using a spatula. To the last add lemon juice.Mix well. Bring everything to a boil. Switch off the stove. Oven baked Tilapia, onion and pepper in a delicious lemon garlic butter sauce. 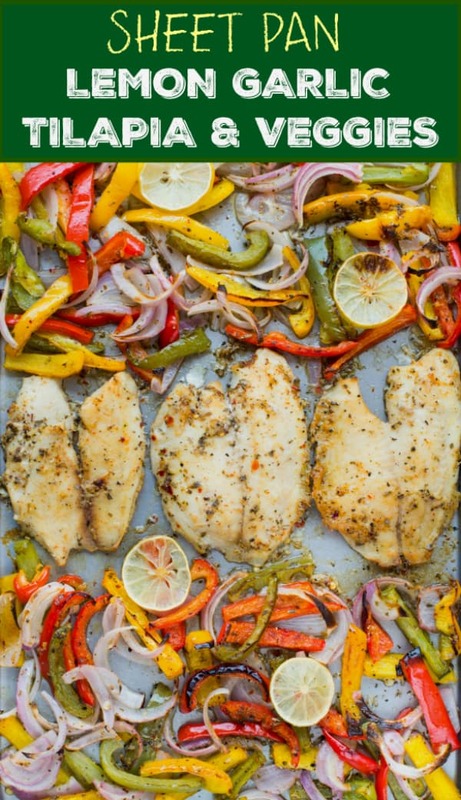 This Sheet Pan Lemon Garlic Baked Tilapia and Veggies is a healthy dinner made in under 20 minutes. Love Fish ?? 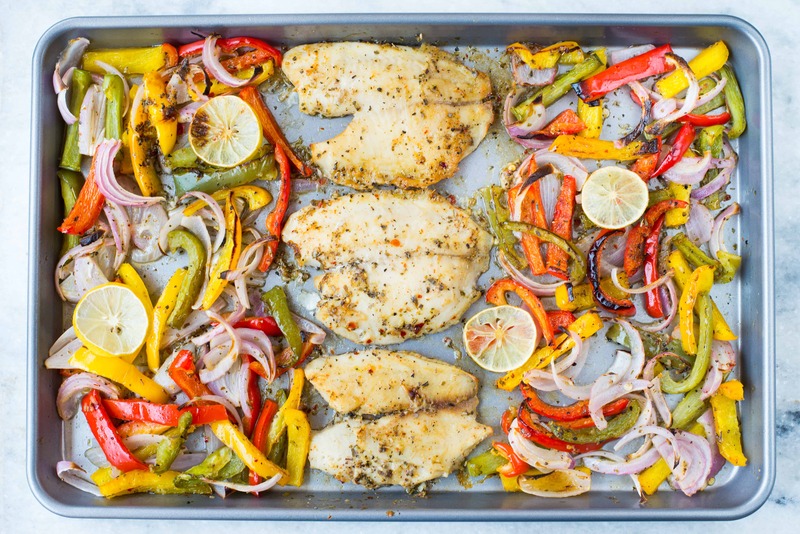 Love Sheet pan recipes? 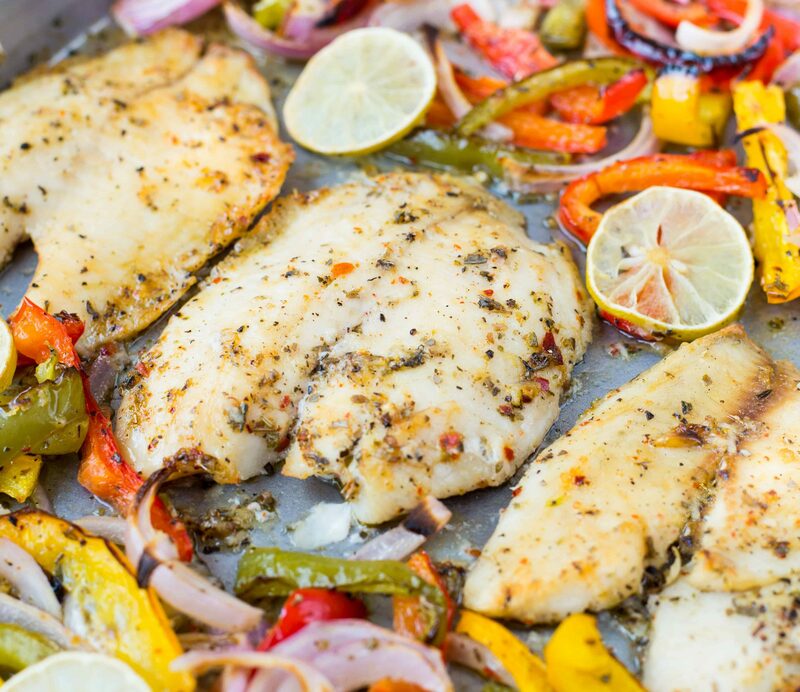 Then Oven Baked Tilapia and Veggies in lemon garlic Sauce is the perfect dinner for you. It is super easy and quick to make. It is healthy and low carb too. The sauce is packed with Buttery Lemon Garlic sauce. The Lemony herb sauce is refreshing and packed with flavour. 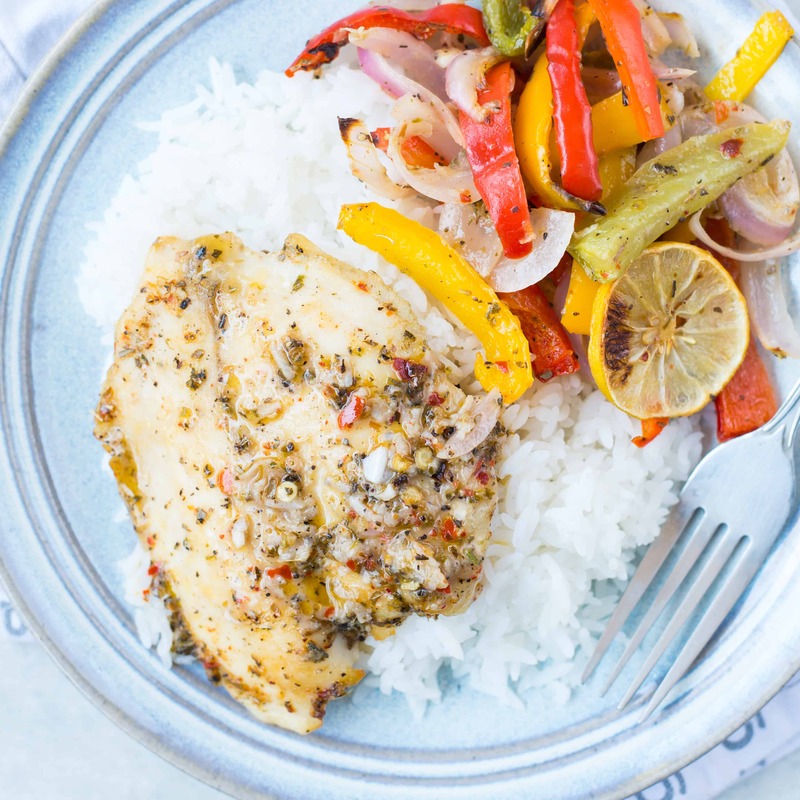 Moist, flakey Baked Tilapia fish with crunchy onions and peppers is going to be a family favourite for sure. We love fish at home. Though freshwater fish is more preferable, we do try different kinds of fish. On Sundays, if you visit the local fish market, you would be really surprised to see so many varieties of fish. I always end up buying a new variety of fish, almost every week. I mostly make curry or pan fry it. Last month we had baked fish with a delicious butter sauce while dining out. It was so very good. I could not stop myself from trying the dish. The outcome was pretty close and the sauce was to die for. I have used frozen tilapia here. You can use any other white fish instead of tilapia. Whichever fish you decide to use, two things that are important when it comes to baking any fish. First, a perfect seasoning and second baking it right. Because Tilapia is a mild fish, a good bold seasoning is a must for Baked Tilapia. This recipe uses a refreshing lemon and Italian herb marinade. Butter in the marinade helps to keep the fish moist and tender. Make sure you apply the marinade on both the side generously. Next important step is baking tilapia at the right temperature and time. Tilapia is a very delicate fish and it is very easy to overcook it. For really moist and tender Tilapia, Bake at 200 C / 400 F for 10-12 minutes. Once the fish is perfectly baked, you might find there is liquid in the pan. So what I do is, I remove the fish and broil the veggies for 2-3 minutes. This makes sure your veggies are still crunchy and the liquid has reduced to a thick gravy. If you are using frozen fillets, then make sure you thaw it completely before baking. If you are using tougher veggies like broccoli, carrot etc, par-bake them first then follow rest of the recipe. In India spring is for very short. Even before we realise, summer kick in. It is really getting hot nowadays. All I am thinking about is popsicles, coolers and Ice-cream. I can foresee, in coming days I am making a lot of recipes that are quick and easy. Especially, recipes for which you don’t have to spend hours in the kitchen. 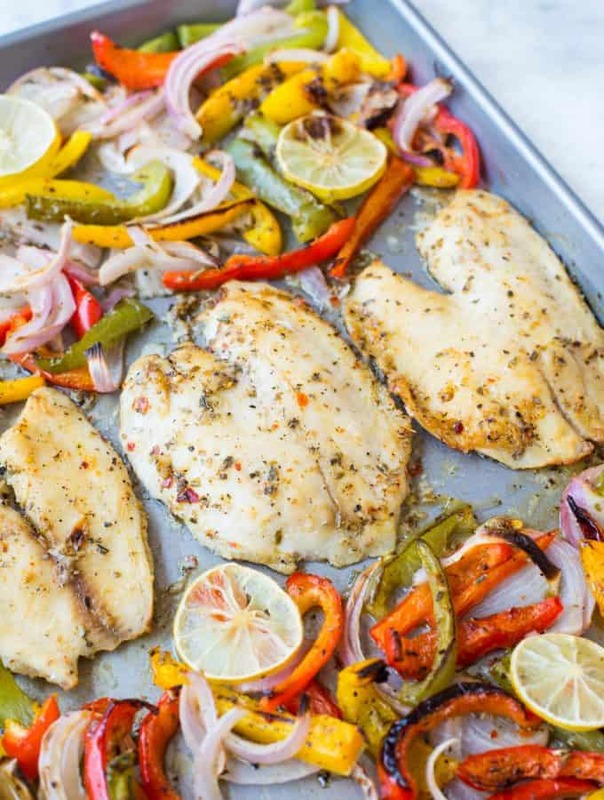 Baked Tilapia with onion and pepper in a delicious lemon garlic butter sauce. 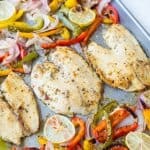 This Sheet Pan Lemon Garlic Baked Tilapia and Veggies is a healthy dinner made in under 20 minutes. For the marinade mix melted butter, garlic, lemon juice, herb, chilli flake, salt and pepper in a bowl. In a baking tray add sliced onion and pepper. Add a couple of spoon of the above marinade. Mix well. Then place Tilapia fillets. Brush rest of the marinade evenly on both the sides. Bake in a pre-heated oven at 200 C/ 400 F for 12-15 minutes. Serve on a bed of rice alongside veggies. Spoon leftover lemon butter sauce from the pan. 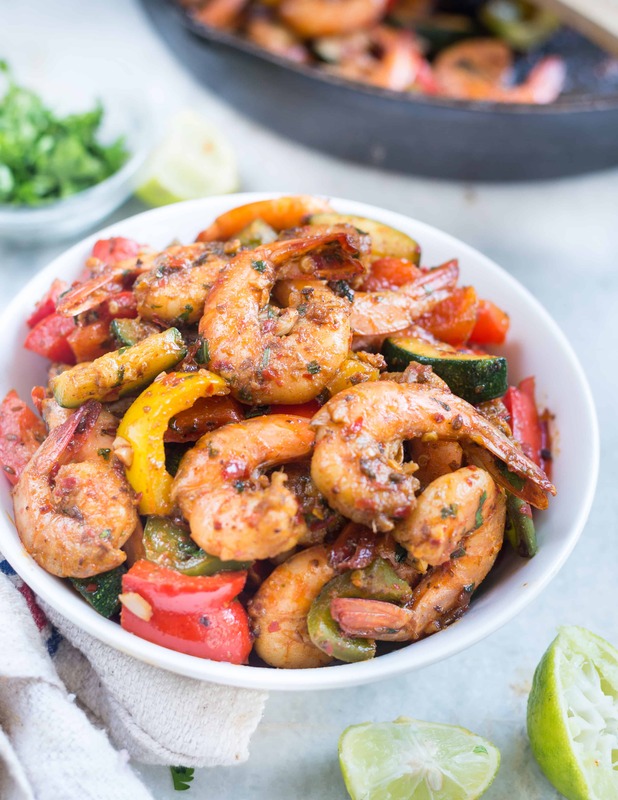 This Easy Garlic Butter Shrimp and Vegetable Skillet made with Fresh Shrimps, butter, tons of garlic, cumin and herbs.It is Protein-rich, low carb and ready in under 20 minutes. Hey guys!! Another low carb, super easy and quick recipe for you. 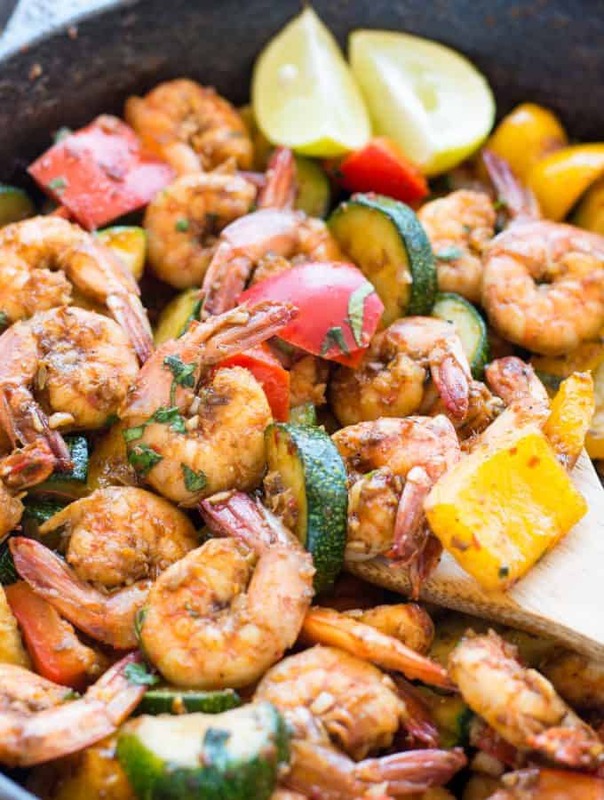 This Easy Garlic Butter Shrimp and Vegetable Skillet have all of my favourite ingredients. You know what makes this Butter Garlic shrimp different from all other recipes out there?? It is the Roasted Cumin Powder. I love love love Cumin. You would find whole cumin seeds and roasted cumin powder in my kitchen any time of the year. The earthy aroma that cumin gives just so good. Cumin is widely used in Indian Cuisine. Whole cumin is used for tempering, while roasted powdered cumin is used in almost all types of curries and stir-fries. One of my favourite ways of using roasted cumin powder is to sprinkle on top of plain yoghurt. Garlic Butter shrimp is such a classic and one of our favourites. I make it quite often as an appetizer or to serve over pasta. This time I upgraded the usual Garlic Butter Shrimp to a wholesome and more flavourful meal. Crunchy peppers and Zucchini not only added that extra crunch but also provided required fibre. 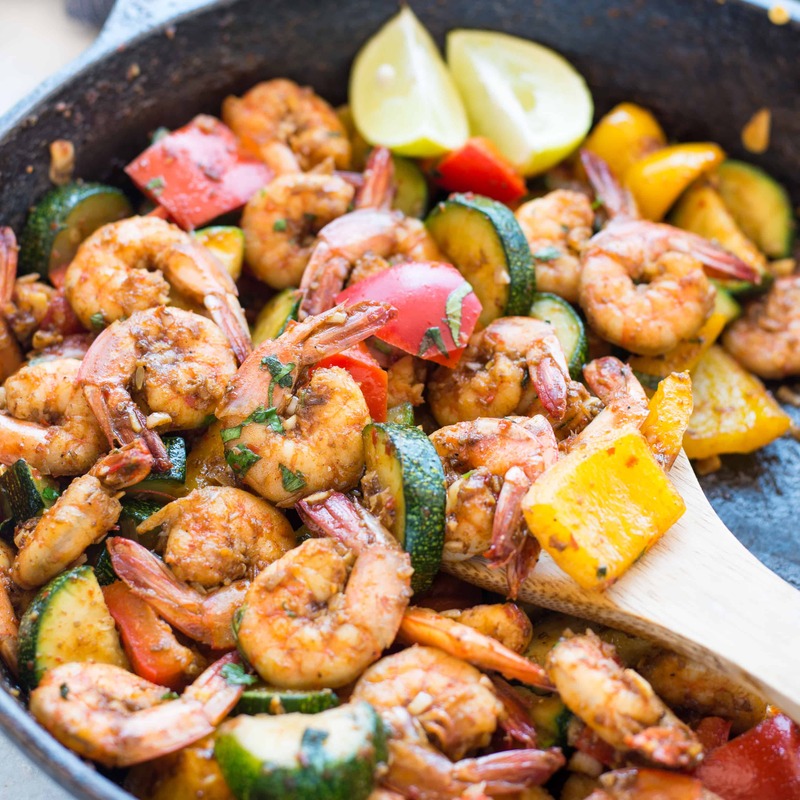 All it takes is one Skillet to make this Easy Garlic Butter Shrimp and Vegetable Skillet, so less mess and minimal clean-up. I used my Lodge Cast Iron Pan here. ✔ Less than 10 ingredients. ✔ Take less than 20 minutes start to end. ✔ High in protein, Low Carb and loaded with vegetables. ✔ Most Importantly it is damn delicious. Let me walk you through the recipe really quick. Start with the freshest Shrimp. I like to keep the tail on because it looks pretty in Picture ;). Ok, not exactly !! Keeping the tail on adds extra flavour to the dish, so It is up to you to decide. Add butter (lots of it..) to the hot skillet, along with little oil to prevent butter from burning. Add clean shrimp, saute for a couple of minutes. Next, add garlic, spices. Mix well !! Then add peppers and zucchini. Finish off the dish with a good squeeze of lemon and fresh parsley. Toss everything well. And that’s IT. Your dinner loaded with flavour and texture is ready in no time. In a hot pan, add butter and little oil. Add cleaned shrimps. Cook for 4-5 minutes, until the shrimps, turns pink in colour. Add minced garlic. Fry for 1 minute. Add cumin powder and chilli flakes. Mix well. Add Zucchini and peppers. Mix and cook for 3-4 minutes. Add fresh lemon juice and chopped parsley. Toss everything quickly and switch off the flame. Serve as it or on top of rice. 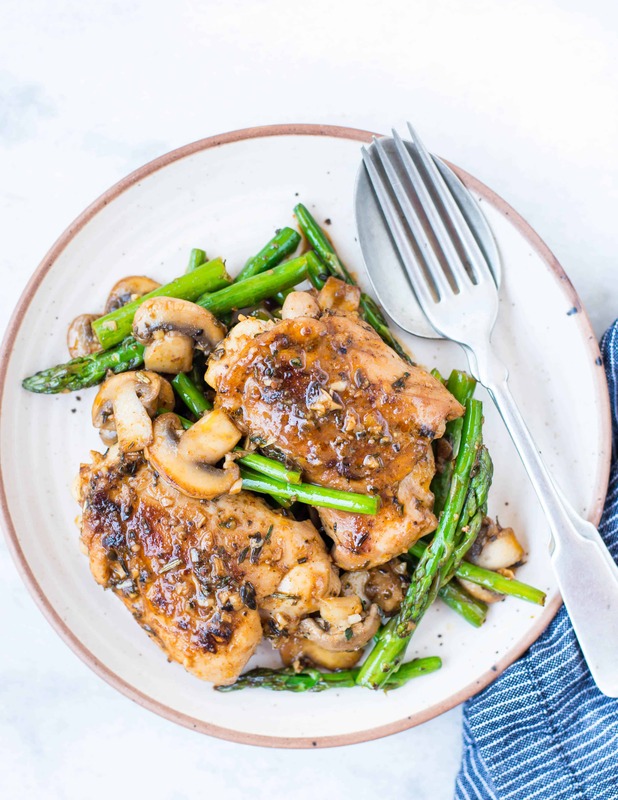 This Lemon Herb Chicken, Asparagus, & Mushroom Skillet is fresh, healthy and low carb dinner made in one pan in under 30 minutes. The buttery lemon herb sauce is flavourful and delicious. 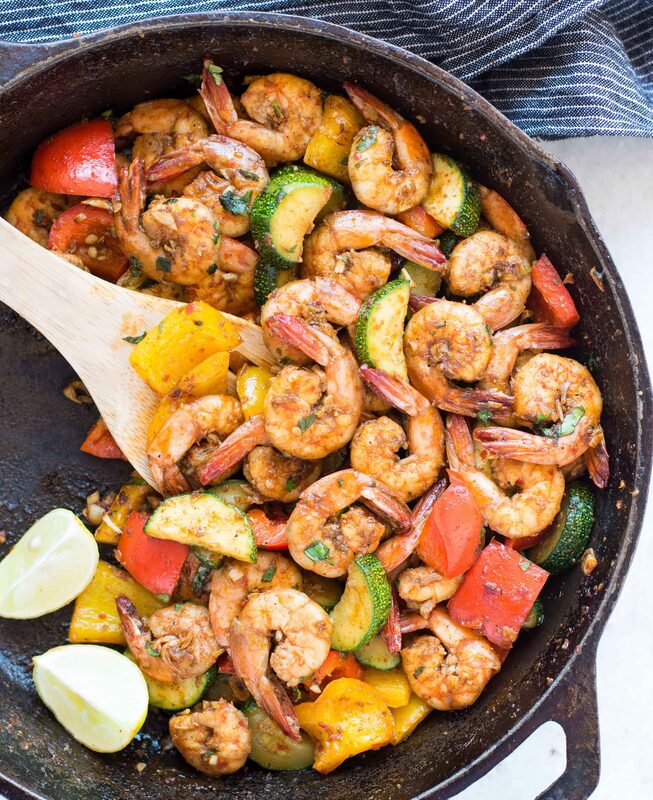 Let’s talk about this fresh and vibrant looking one pan recipe today. If you want me to pick one favourite thing about this dish, trust me I can’t. I mean this dish has everything that one would need for a perfect dinner. It is one pan, so easy to clean up. It has the right balance of protein, fat and carbs. You will not miss your veggies as well. And the sauce is to die for. I would pair it with some rice or noodles, for a complete meal. Are you a team boneless chicken breast or chicken thigh? Honestly, I love both of them. I mean if know the right way of cooking it, both taste great. Many might disagree with me and tell chicken thigh is always better. It is absolutely true, but with a good marination and right cooking time, chicken breast can also be juicy and tender. My preference differs, depending on the recipe. 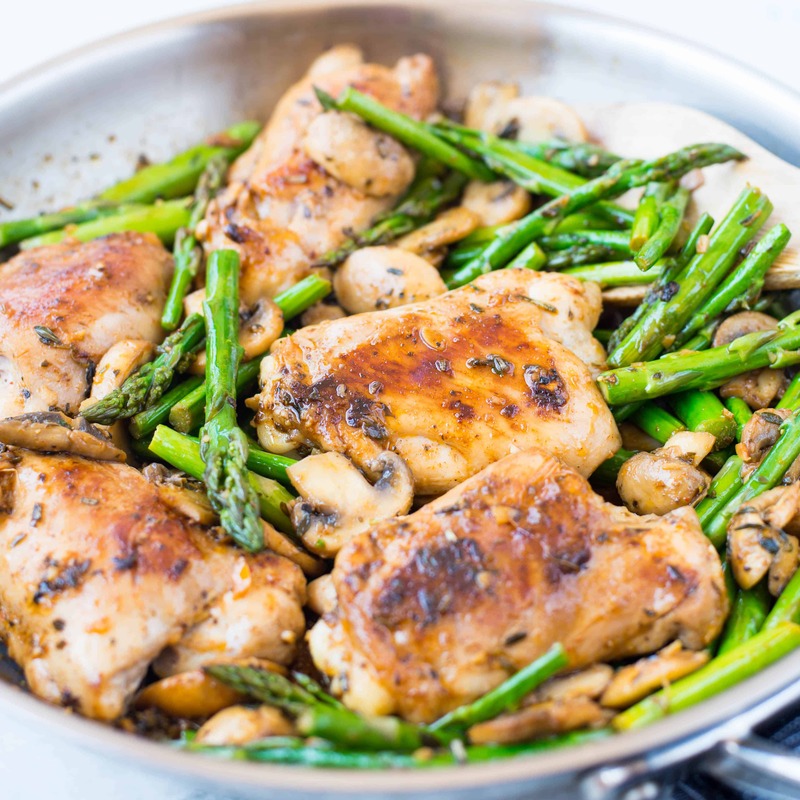 Coming to this Lemon Herb Chicken, Asparagus, & Mushroom Skillet, both chicken breast and thighs will work here. All you have to do is adjust the cooking time. You can also bake the chicken one you have seared the meat. All that juice released from the chicken will make a delicious butter herb sauce. With spring around the corner, Asparagus is going to be soon in season now. Asparagus tastes best when it is still crunchy and the seasoning is not overdone. 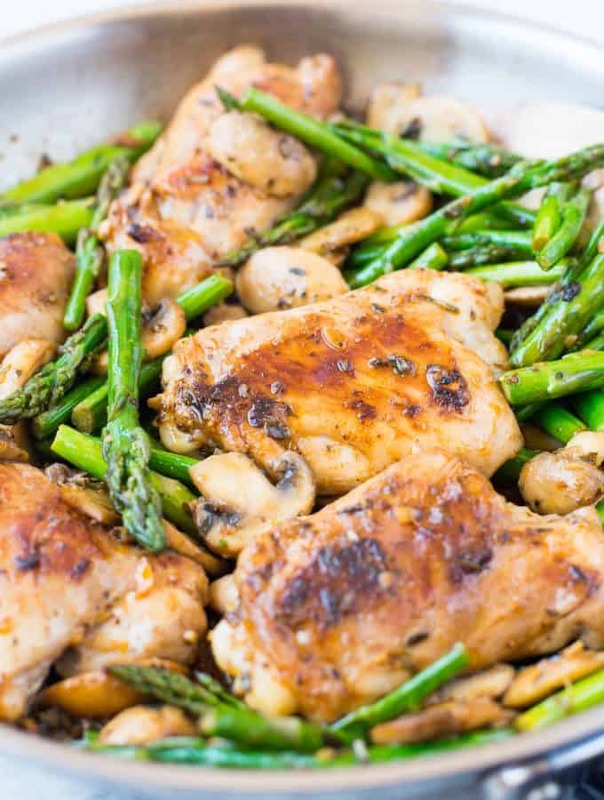 The lemony herb butter sauce goes well with asparagus by retaining its natural taste. Not only Asparagus is a delicious vegetable, it is high in fibre and loaded with nutrients too. When we are talking about asparagus, you must check Chicken Asparagus Stir-fry Noodle recipe. 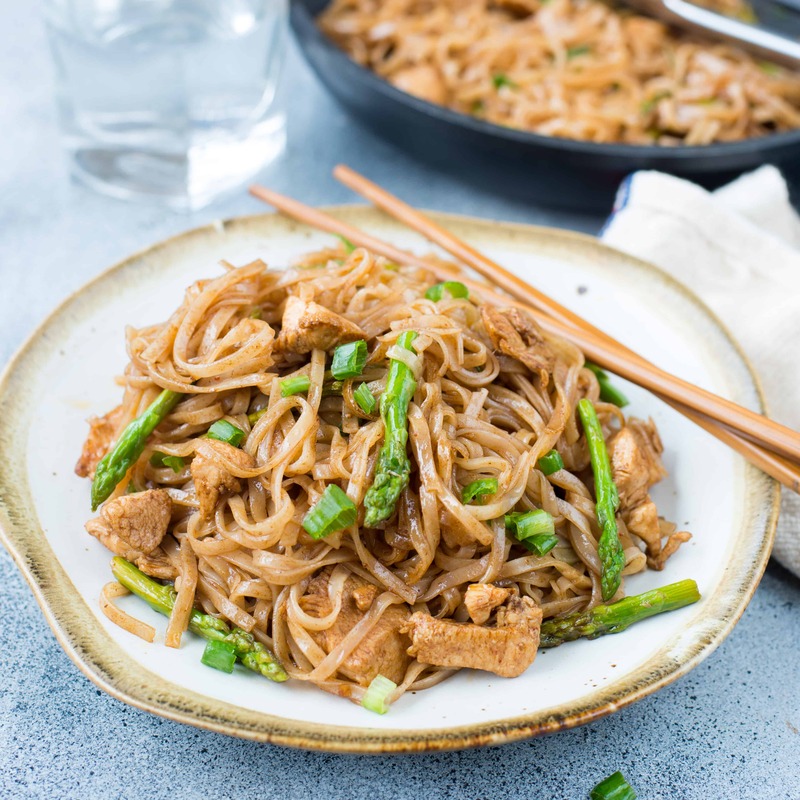 This noodle stir-fry has lovely Asian sauce, Gluten-free rice noodles and crunchy Asparagus. Season chicken with salt and pepper. Keep aside. In a pan add half table spoon of butter. Add sliced mushrooms. Cook till mushroom is cooked and looks golden brown in color. Remove and keep it aside. In the same pan add 1 tbsp butter. Add minced garlic. Stir and cook till aromatic. Add minced herb and stir well. Add chicken thighs. Coat it well with herbed butter. Let it cook for 5 minutes. Add Lemon Juice and Paprika. Coat chicken pieces well. Let it cook both the sides. Add little water if it starts to burn. Add Sauted mushroom and asparagus. Toss everything well. Let it cook for another 5 minutes. 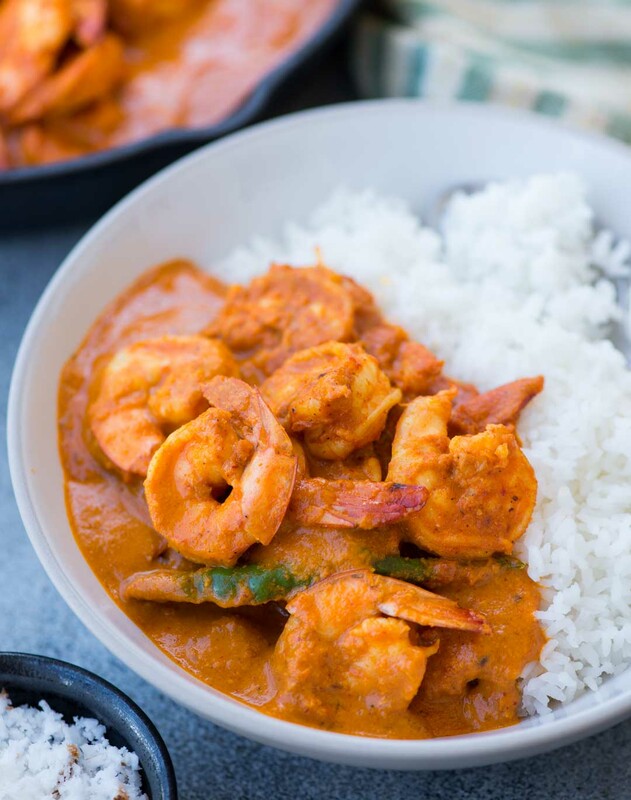 Serve warm with hot steamed rice or have as it it. 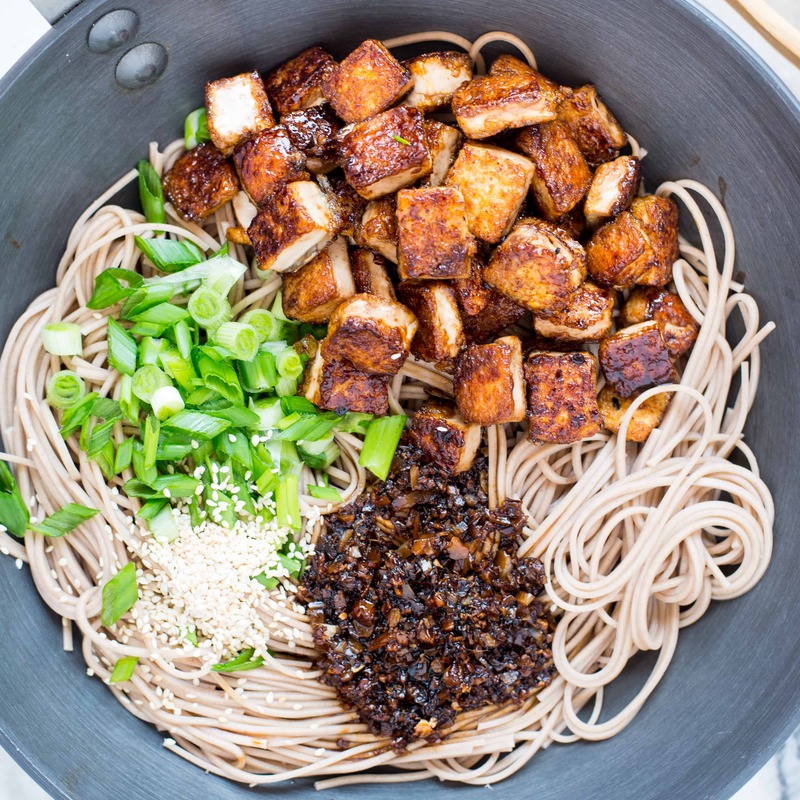 This Crispy Sesame Ginger Tofu with Soba Noodles is delicious, protein-rich and Vegan. 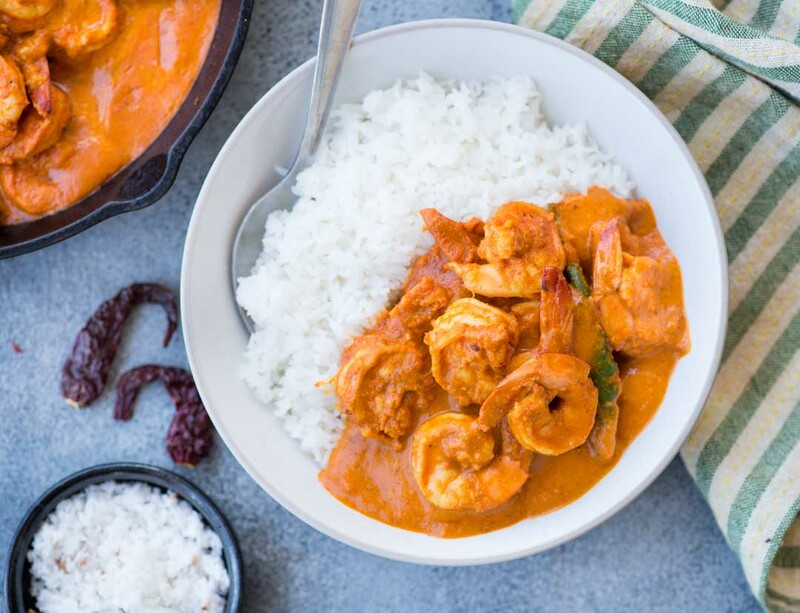 The sweet and spicy sauce loaded with ginger and garlic brings a lot of flavor to the dish. 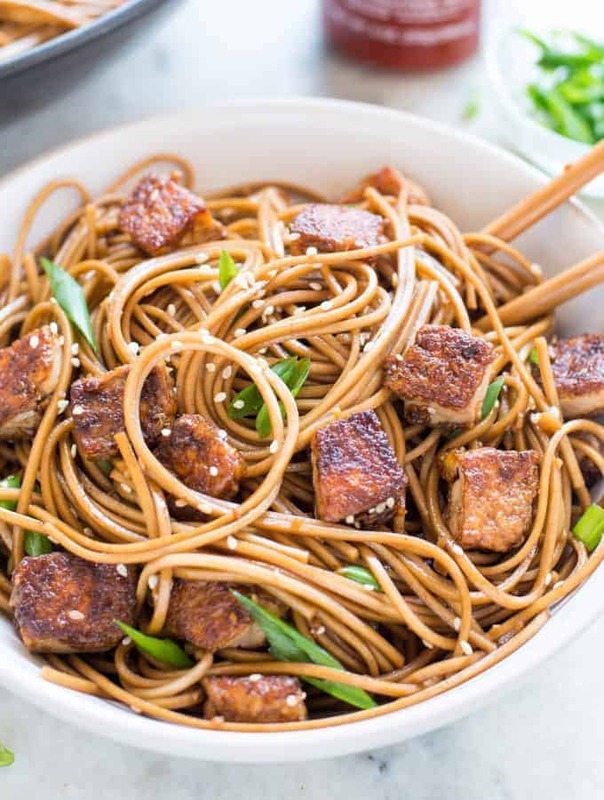 This Crispy Sesame Ginger Tofu with Soba Noodles is refreshing, with tons of flavor. Noodles in any form are always welcome at my home. A quick lo mein with loads of veggies and chicken is regular at our home. Lately, I am substituting all-purpose flour noodles with a healthier alternative like whole wheat noodles. And now our new favorite is Soba noodles. A couple of months back, I made a delicious broth soup with mushrooms, bok choy, and soba noodles. I quite like the nutty taste of Soba noodles. It definitely tastes very different from regular noodles but a good broth or a sauce will do the magic. In case you are new to Soba noodles, let me tell you few things about this healthy noodles. Soba noodles are Japanese noodles that are made from Buckwheat flour. 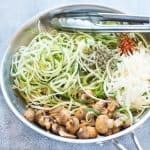 Excellent alternative to Wheat-based noodles with some health benefits. 100% Buckwheat flour soba noodles are gluten-free. So if you are gluten intolerant, then this noodles would satisfy your noodle/pasta craving. Generally, Soba noodles have few percentage of wheat flour in it. So If you are looking for absolute gluten-free, make sure they are made with only Buckwheat flour. Along with gluten-free, these are rich in protein and amino acids. Its higher protein content makes it popular among vegetarians, especially Vegans. This noodles is less in calorie and higher in fiber when compared to traditional pasta or noodles. 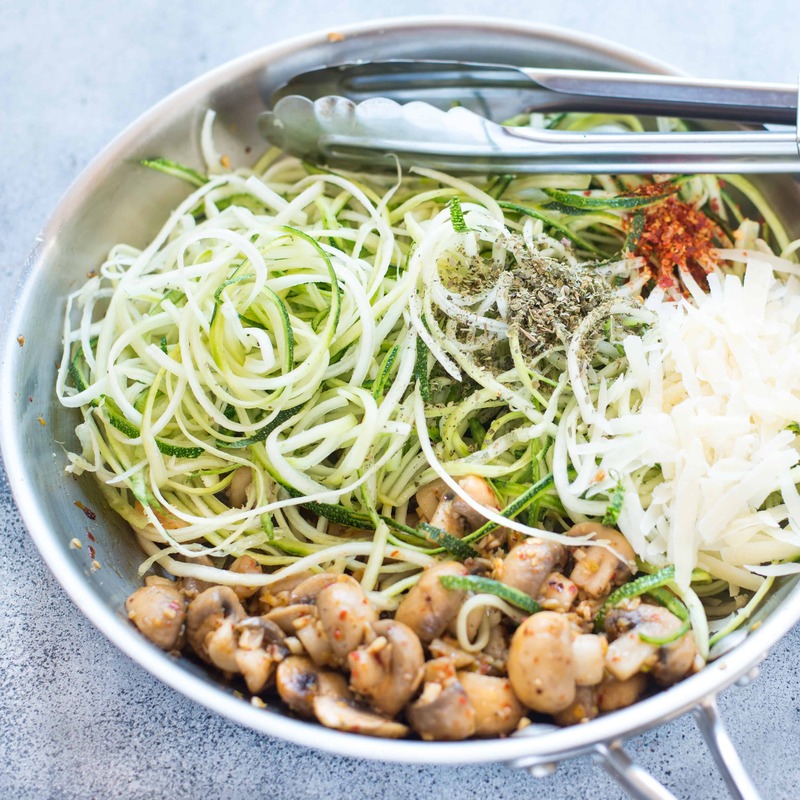 Here are a couple of articles 7 Benefits of Soba Noodles, Are Soba Noodles Healthy? that gives an insight into the health benefits of soba noodles. 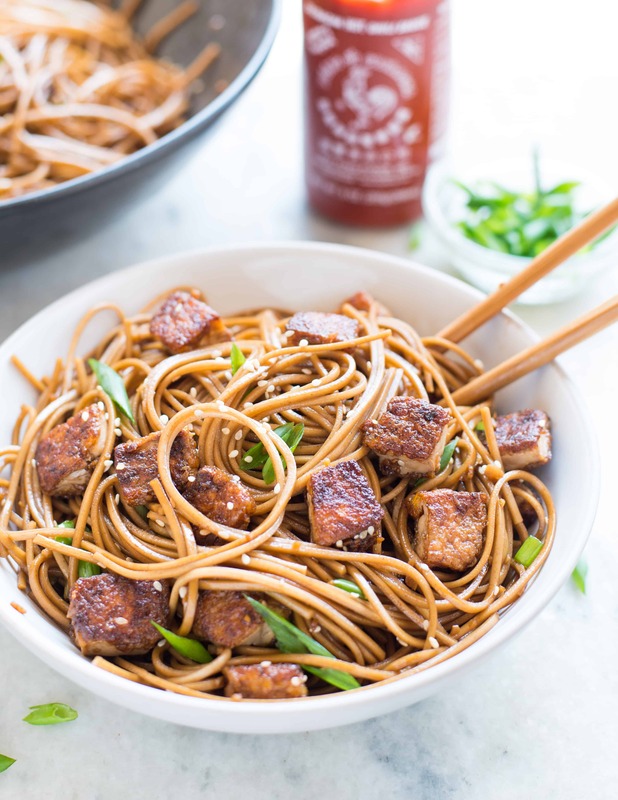 So overall this Crispy sesame ginger tofu with soba noodles is easy, quick, vegan and rich in protein too. 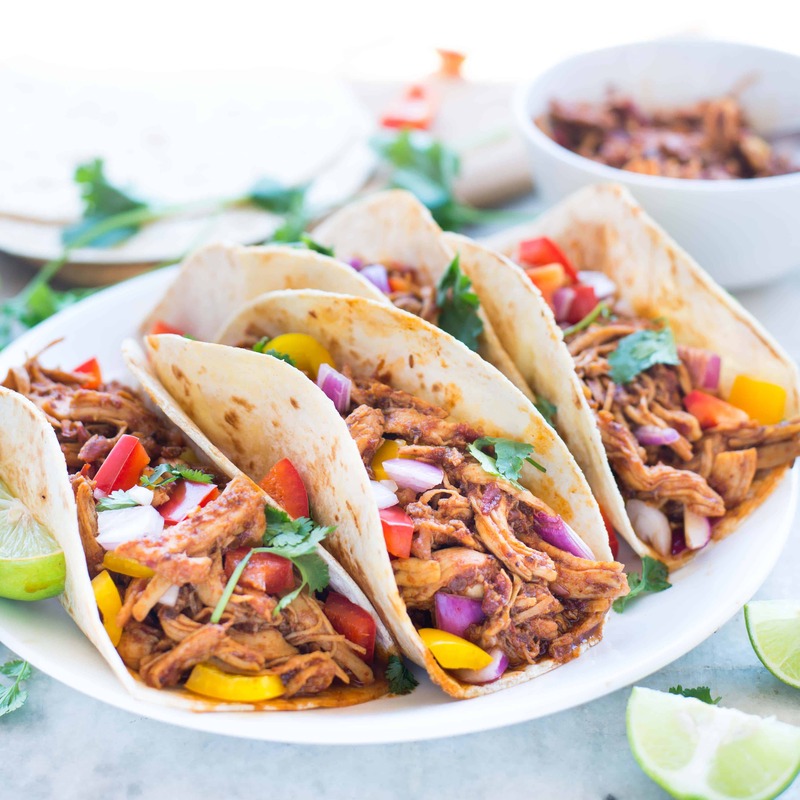 Perfect on the busy weeknights, when you want to have healthy filling dinner with less of a hassle. 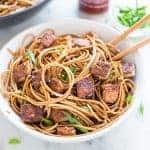 In this stir fry Protein not only comes from soba noodles, tofu is also an excellent source of protein. To get perfectly crisp tofu, I have given some easy tips in this Crisp Tofu in Chinese Garlic Sauce recipe., another favorite and popular recipe on the blog. 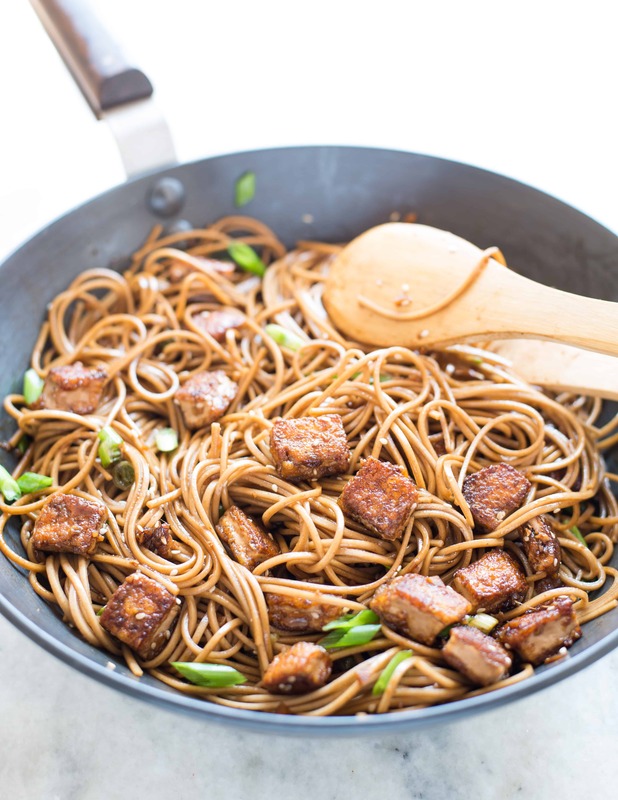 This Crispy Sesame Ginger Tofu with Soba Noodles is a delicious, healthy and Vegan stir fry. The sweet and spicy sauce loaded with ginger and garlic brings a lot of flavor to the dish. Cook Soba Noodles as per package instruction. Run under cold water and keep aside. Prepare tofu by following instructions mentioned above. In a bowl mix together Soy sauce, Honey, rice vinegar, and sriracha. Keep aside. Season tofu cubes lightly with salt and pepper. Toss in Cornflour. Heat a pan. Add 1 tspn oil. Once pan is hot spread tofu cubes in single layer. Fry undisturbed till they are golden brown in color. Turn and fry again till the otherside is golden bworn in colour. At the end add 1 tablespoon of the above prepared sauce. Cook for a couple of minutes, till all the sauce has been soaked. Remove from the pan and keep aside. In the same pan, add minced ginger and garlic. Once the sauce starts to bubble, add cooked noodles. Toss well. Add Crsipy fried tofu cubes. Mix everything well. Sprinkle toasted sesame seeds and green onion. 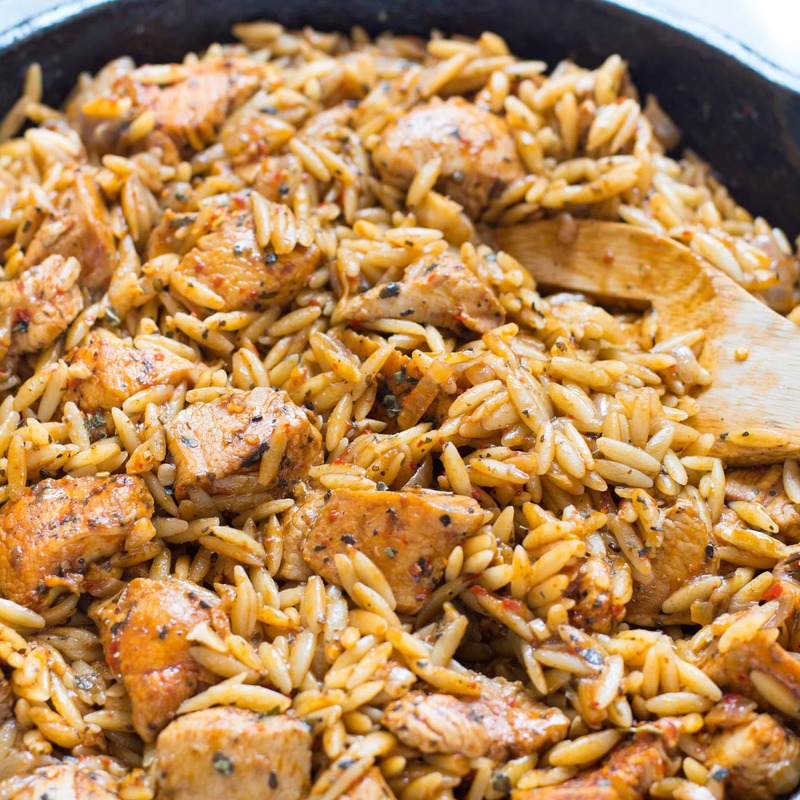 This One Pot Spicy Tomato Basil Chicken With Orzo is spicy, creamy and loaded with flavor. A quick and easy dinner that everyone will love. 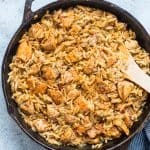 Aren’t one pan recipes best?? When there is a time crunch or too tired to cook an elaborate meal, all you need is a one-pan recipe. I usually end up making one pot flavored rice a lot. This is the first time I got orzo. 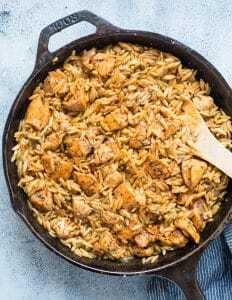 If you are not aware, Orzo is also a kind of pasta.Because its shape resembles a lot to rice, I wanted to do something similar to my usual rice preparation. 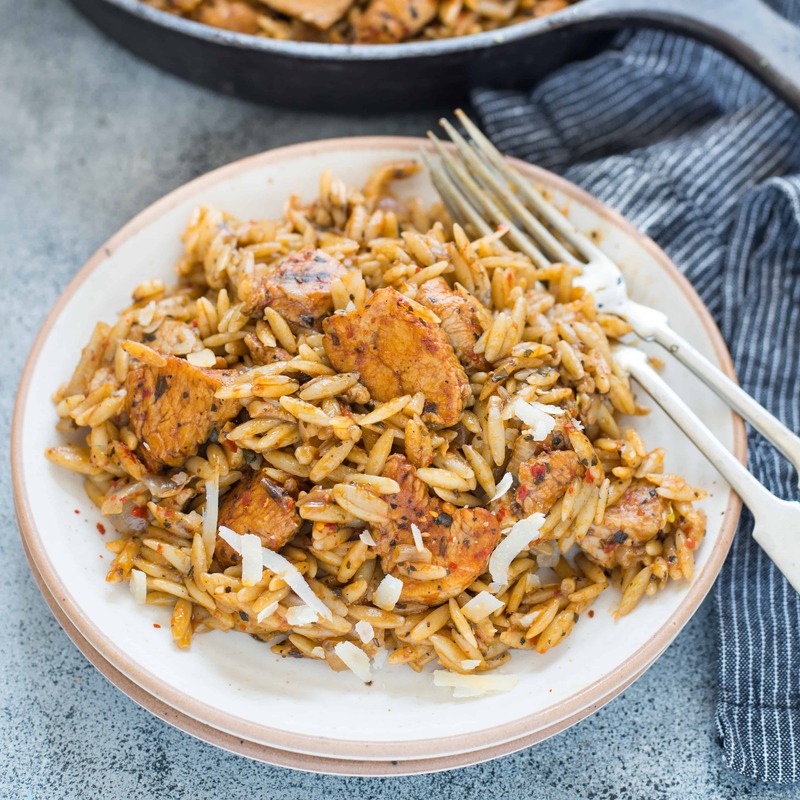 Tomato rice is an absolute favorite and this Spicy Tomato Basil Chicken with Orzo is an Italian variation to the same. Garlic, onion and Italian herbs make this delicious. 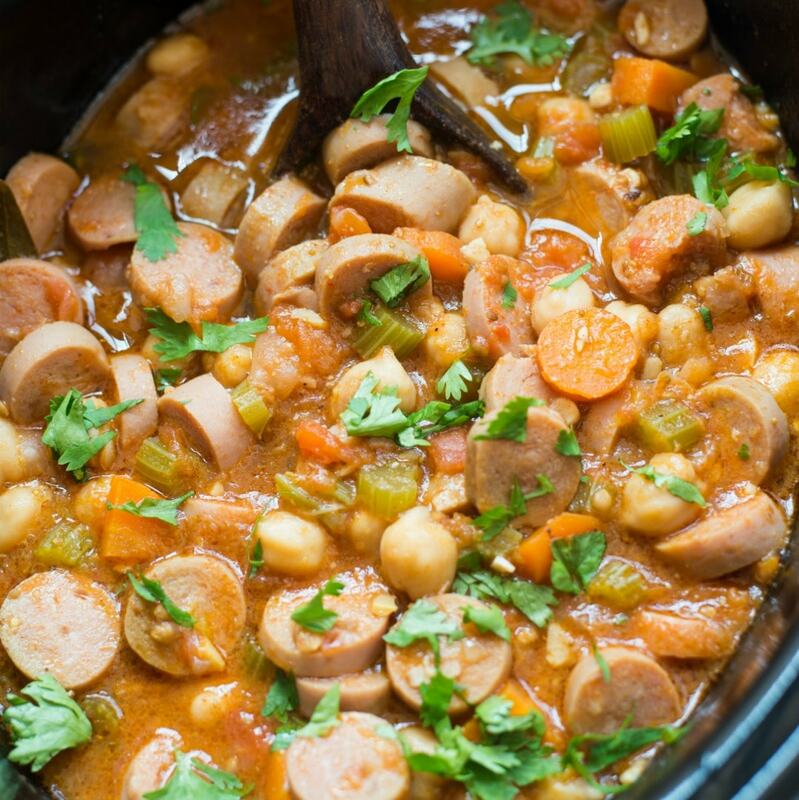 With only a few ingredients, this one pot meal is very satisfying. Best thing is you can go as creative as you can in this case. Chicken, shrimp or mushroom, It is up to you what you pair with Orzo. I was planning to add some parmesan, but it was already creamy enough, so skipped the parmesan. But I am sure parmesan will make it even more delicious. 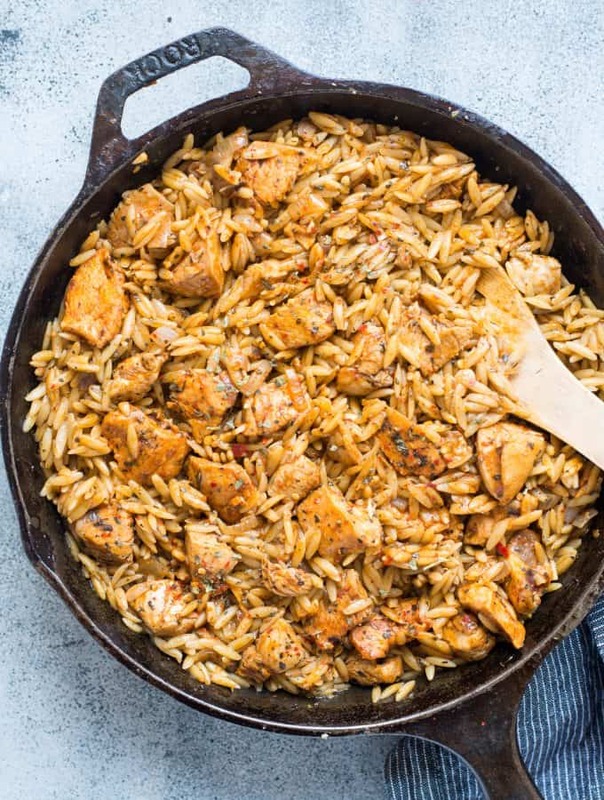 There are a couple of things you need to take care while cooking Orzo. First cooking it just until it is done and the second one is the amount of stock you add while cooking. Anyone one of this goes wrong and you will end with a pot of mushy Orzo. When there is still little liquid in the pan switch off the flame. It might look saucy but once it slightly cools down Orzo will soak up all the liquid. Another thing that you need to take care is, not to stir frequently while it is getting cooked. Frequent stirring results in starchy and mushy Orzo. After you add the stock, let it boil. Once it starts to boil, lower the flame and let it cook on low heat. Heat a pan.Add butter and few drops of oil. once hot add chopped Onion. When Onion is soft and looks transparent add minced garlic. fry for 30 seconds. Add cubed chicken. Cook for 2 minutes on medium-high heat. Add tomato puree, herbs, chili flakes. mix everything well. Add Orzo and warm chicken stock. Season with salt. Once it starts to boil, lower the flame and let it cook slowly. When almost all the water has been evaporated but still it looks little sauce, switch-off the flame. At this point, if you want you can add shredded parmesan and give everything a good mix. Else while serving sprinkle some cheese on top. Always add warm stock to the mixture. Adding cold/room temperature stock will make the chicken cubes tougher. Try to serve this immediately after cooking. Keeping it for too long, Orzo would soak all the sauce. You can also add fresh basil leave to the end. 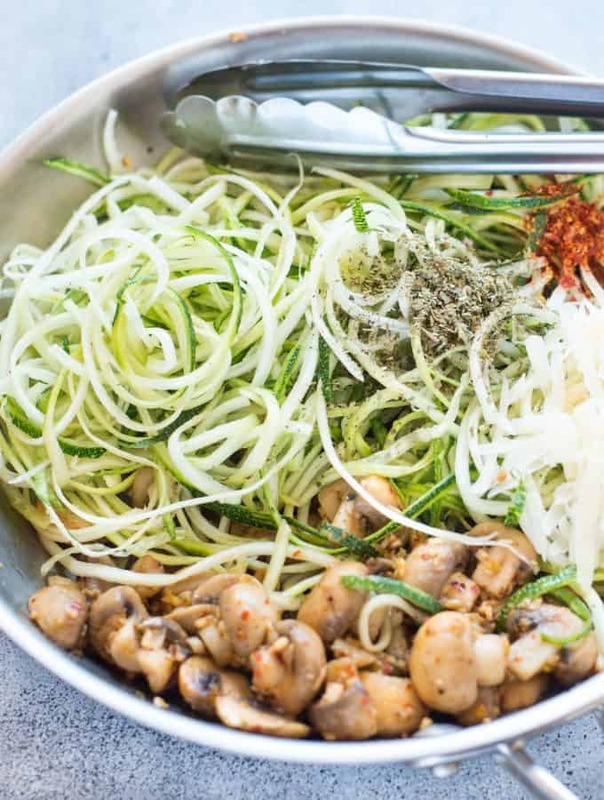 This 15 minutes Garlic Parmesan Mushroom Zoodles is one pan and just 6 ingredients. 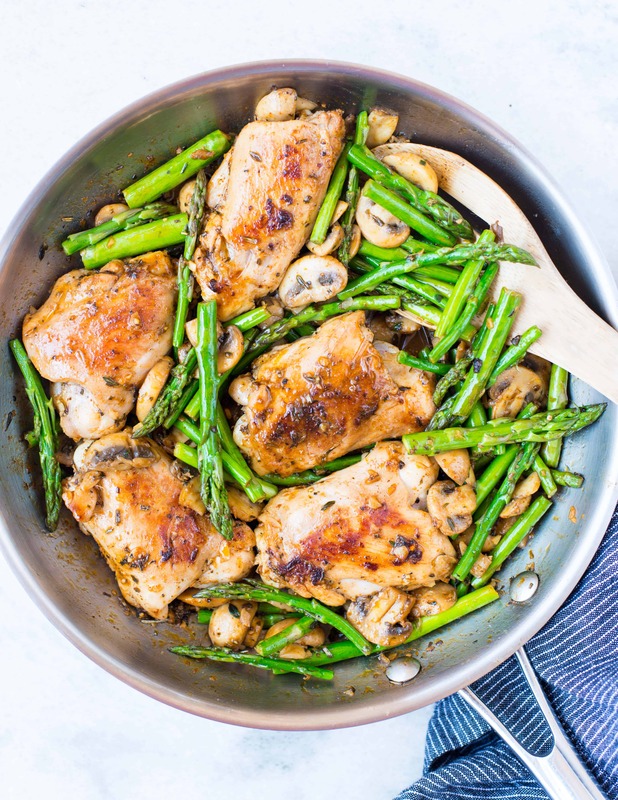 A delicious low carb dinner for the entire family. In my previous post Zucchini Coconut Flour Pancakes, I had told you that I have been using Zucchini a lot. And I really meant it. This vegetable is a must when I go for my weekly shopping. And I have been trying different recipes with this vegetable. Do you know 100 grams Zucchini has is just 16 calories with 3.35 grams Carb? (Source: Fatsecret) . 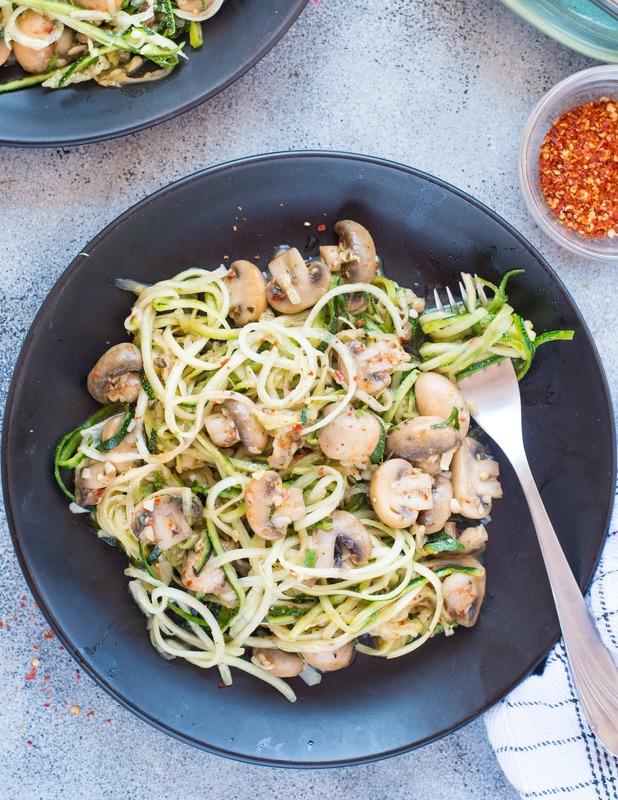 This veggie is loaded with dietary fiber and Vitamin C. If you are on a weight loss regime or want to lower your carb intake then Zucchini is a blessing. It is easily available and not that expensive too. 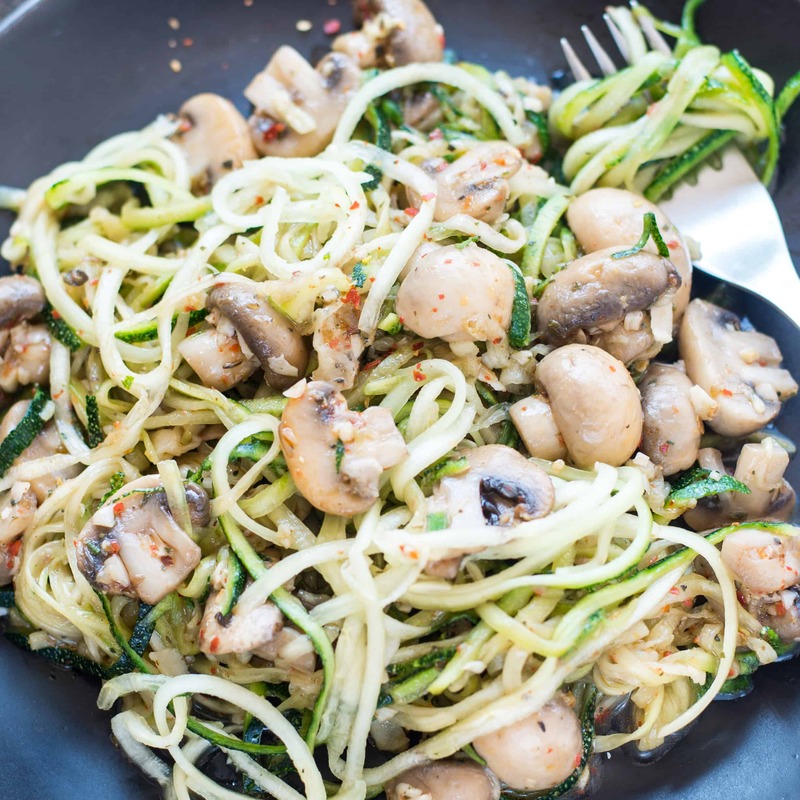 One of the popular recipes using Zucchini you will find Zoodles. 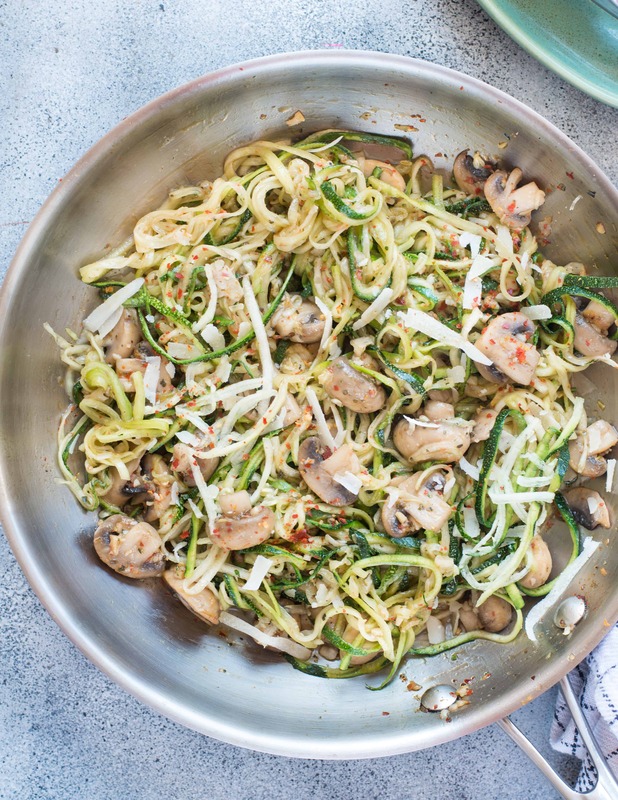 Zoodles recipes are all over Pinterest. My kitchen cupboard is already filled with appliances. There is hardly any space left for a new tool. Finally after a lot of hesitation got this small handy Spiralizer. I am quite happy with this one. I have been using this quite a lot. My little one loves having cucumber and carrot noodles. Add sliced mushrooms. Cook till the mushroom is caremelized. Add minced garlic. Cook for another 1 minutes. Add italian seasoning, red chili flakes. Mix everything well. Switch of the flame. Add zoodles and gratted parmesan. If you cook zoodles for a long time it starts releasing water. So to keep them crispy, I switched off the flame then tossed the zoodles. 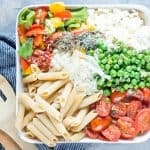 Ricotta Pasta Salad with charred bell peppers, Cherry Tomatoes, and creamy Ricotta is healthy and quick prep. This is a perfect light summer salad or make it for a potluck. I am just back from my daughter’s School Anual Event. It was her first stage performance and we were sitting in the audience like a proud parent. We were as excited as her. It was so fun to see those adorable kids performing on stage.They were dancing out of rhythm, no sync in their steps. All they were doing was performing from their heart and enjoying every bit of it. We were overwhelmed to see them up on the stage. Post-event, we went for a shopping. Now I am dead tired and want to hit the bed asap. After being out the whole day, I have no patience left, But I can’t delay sharing this awesome recipe with you guys anymore. This recipe was long pending. I wanted to share this recipe for a long time.In fact, had made a video, but it didn’t turn out good. And I kept on postponing it. Pasta doesn’t always have to be loaded with cheese and heavy on calorie.Right??? 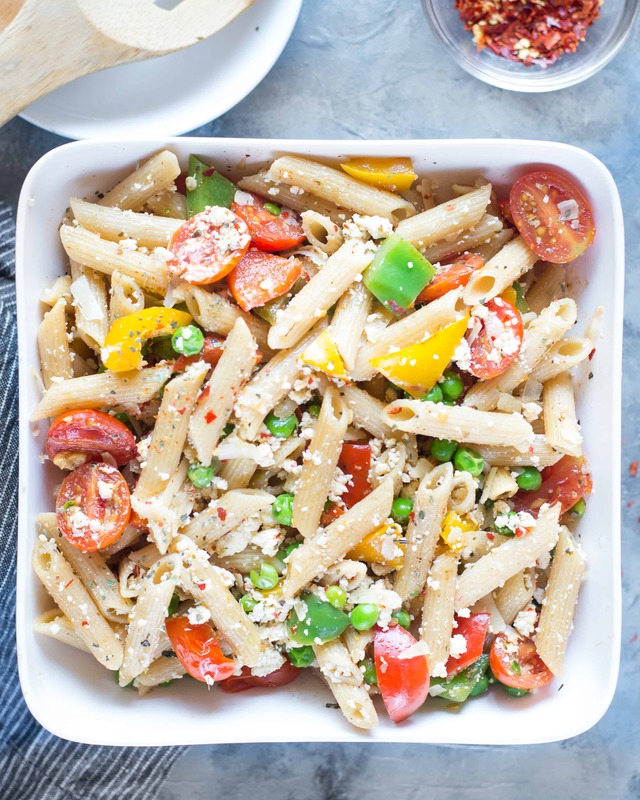 A light creamy pasta like this Warm Ricotta Pasta Salad is a good alternative. 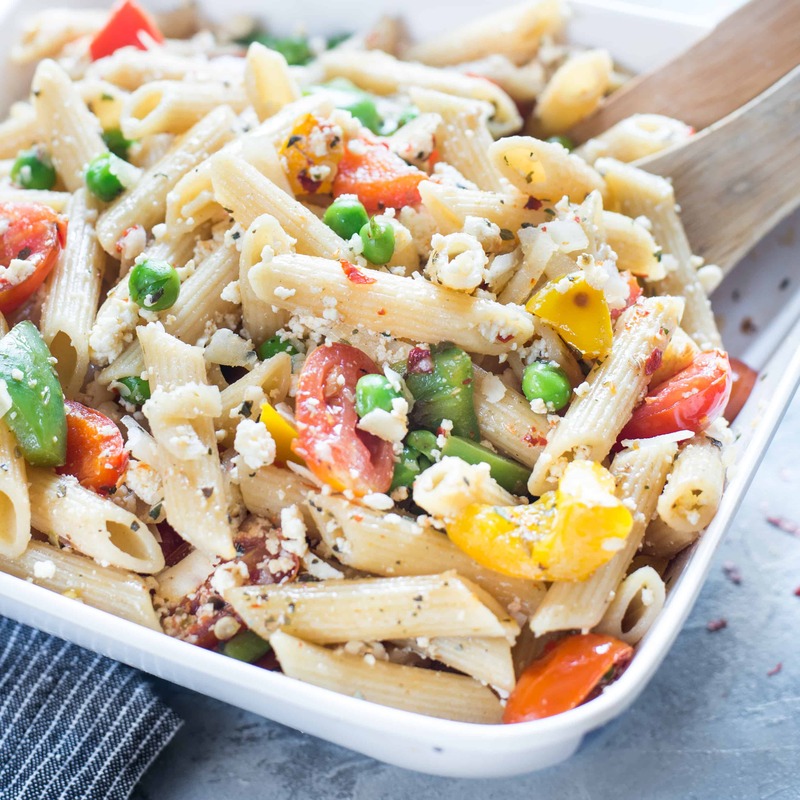 This pasta salad might not have the creamy sauce or a heavy cheesy dressing. But the ricotta is enough to make this creamy. The charred peppers and cherry tomatoes give a nice smokey flavour. Another best thing about this dish is you can serve this salad both warm or at room temperature. So it is perfect for a summer salad too. This salad is a favourite. I kept it vegetarian for meatless days but you can also add roasted chicken to it. 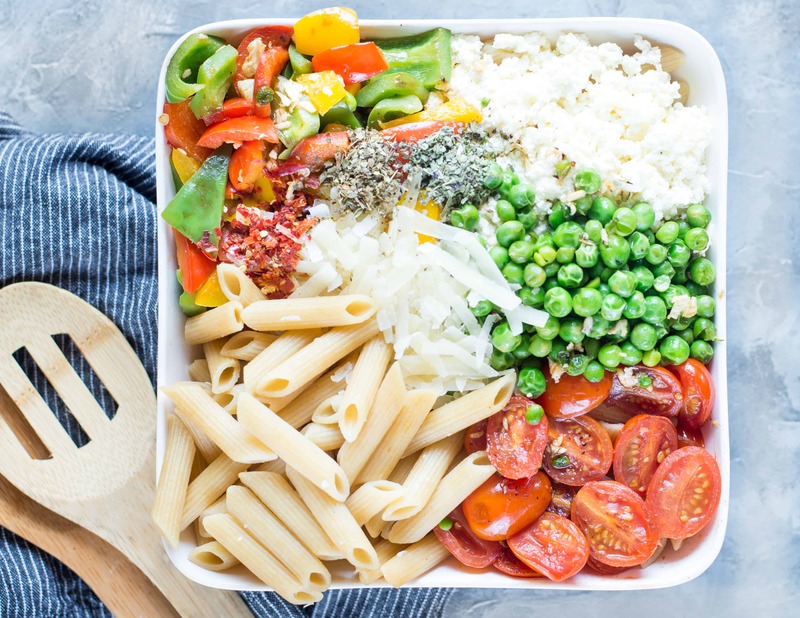 This Salad stays well in the refrigerator, so perfect for your lunch box/meal prep. You need less than 30 minutes to make this salad, so easy to make on busy working days. 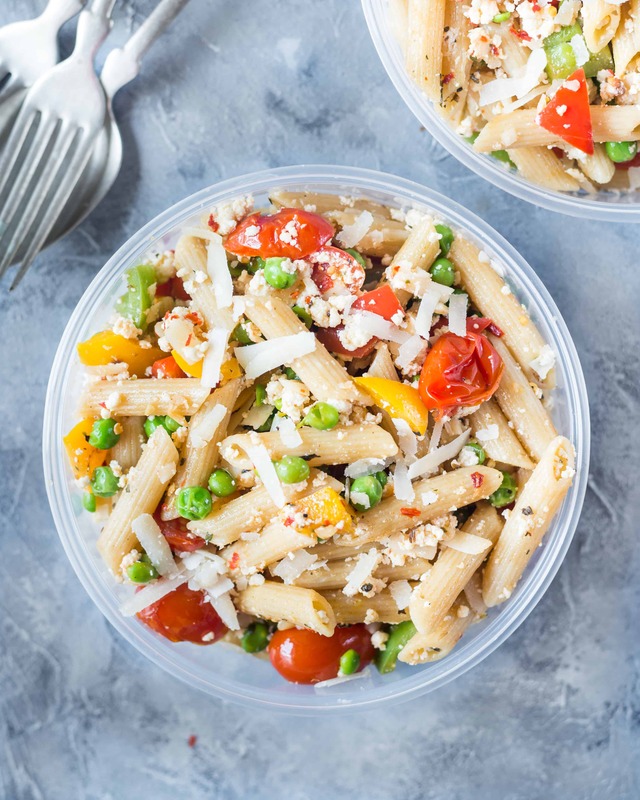 Ricotta Pasta Salad with charred bell peppers, Cherry Tomatoes, and creamy Ricotta is healthy and a perfect vegetarian meal prep / Lunchbox. Cook pasta as per packet instruction. Keep aside. In a pan add 1 tbsp oil. Add minced garlic. Add assorted bell pepper. Stir fry on high heat for 1-2 minutes. The peppers should look charred but still crunchy. Don't over cook. Add green peas. Stir fry for another 1 minute on high heat. Remove from the pan and keep aside. In the same pan add reamining oil. Add halfed cherry tomatoes. Stir fry on high heat for 1-2 minutes. The tomato skin should look charred but again don't over cook it till mushy. 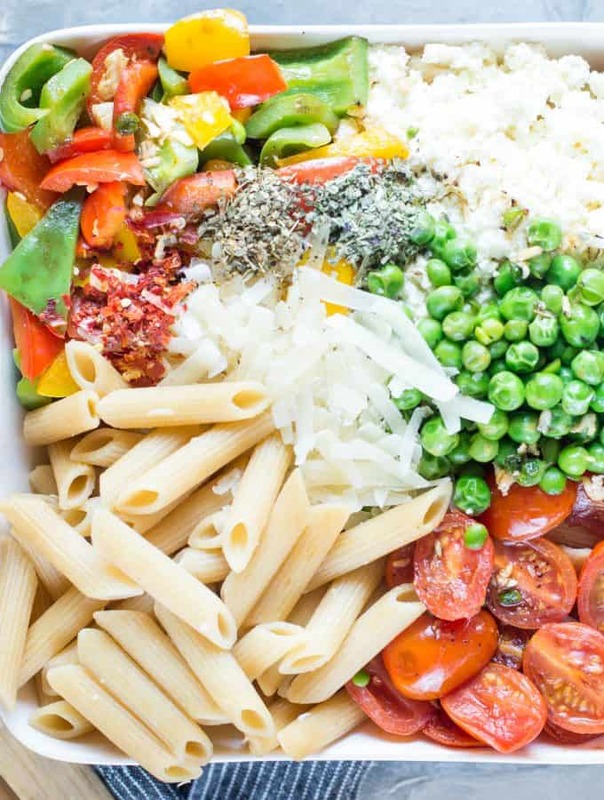 In a big mixing bowl, add cooked pasta, bell pepper,peas, toamto, ricotta, parmesan chees and all the herbs. Season it with salt and pepper. Mix everything well. For the illustration purpose, I have cooked bell peppers, peas and tomatoes separately. So I divided the oil into 3 equal parts and cooked the veggies. You can cook the veggies as per the instruction. While I was cooking the pasta, I prepared the veggies. And while the pasta was still warm, mixed it with rest of the ingredients. 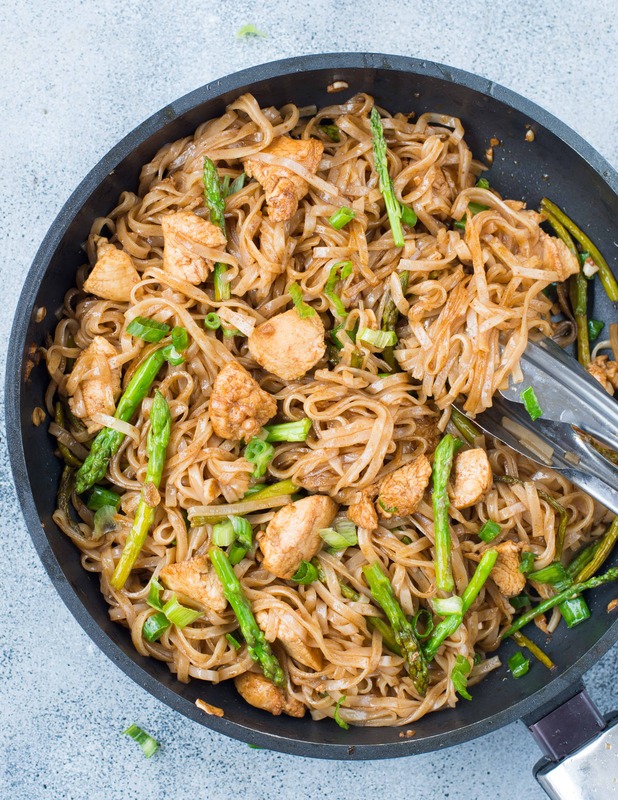 This Saucy Chicken Asparagus Stir fry Noodles with succulent pieces of chicken and crunchy asparagus is bursting with Asian flavours. This 30-minute Rice Noodles Stir Fry is going to be a perfect weeknight dinner. If you talk about quick meals then the first thing that comes to mind is Asian style Stir fries. Once you do all the preparation, you barely need 15 minutes to cook the entire dish. Chicken Stir Fry is my go-to recipe most of the time. I don’t really follow any particular recipe for my Chicken Stir fry. A sweet, spicy and salty stir fry sauce with chicken and any available vegetables in the refrigerator works for me. I serve it along with rice or noodles. This Chinese Five Spice Ginger Chicken is one of our favourite stir fries. I had some Rice Noodles at home. Actually, this is the second time I made this Rice Noodle Stir Fry. Made this about a month ago. The sauce was freaking good. It was sweet, spicy with the delicate flavour of fish sauce. A few days back when I was wondering what to do with the remaining noodles, Husband was like why don’t you do that sweet and spicy sauce noodles. It definitely took me some time to recall it. Rest all it took is 15 minutes to put the dinner on the table. You could just about use any noodles in this recipe. I like Wide Rice Noodles, because it is gluten free, doesn’t need cooking and soaks up the sauce really nicely. I really love to make this Butternut Squash Tofu Thai Curry on a cozy winter night and serve on top of Rice Noodles. Making Chicken Asparagus Stir fry Noodles Recipe is fairly simple. Start with preparing the vegetables. I have added only Asparagus but you can add broccoli, peppers and snow peas as well. Use fresh veggies to have the crunch in every bite. Then you can make the stir fry sauce before you start cooking by adding Sriracha, Soy Sauce and brown sugar. Or as shown in the above video you keep all the sauce ready and add directly to the pan. Cook the noodles as per package instruction. I soaked the noodles in hot water for 15-20 minutes. While rice noodle is getting soaked, heat a pan add oil. Add chicken. Stir for 2 minutes. Then add minced garlic. Followed by whatever veggies you are using. Add sauce and then drained soaked noodles. Mix well. Season with fish sauce and salt if required. 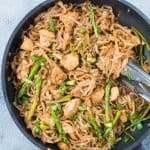 I would suggest serving this Chicken Asparagus Stir fry Noodles immediately, else the noodles would soak up all the sauce in no time. 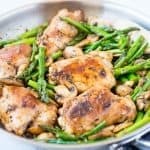 As asparagus is in season now, you must try this Lemon Herb Chicken, Asparagus, & Mushroom Skillet is fresh, healthy and low carb dinner made in one pan in under 30 minutes. The buttery lemon herb sauce is flavourful and delicious. 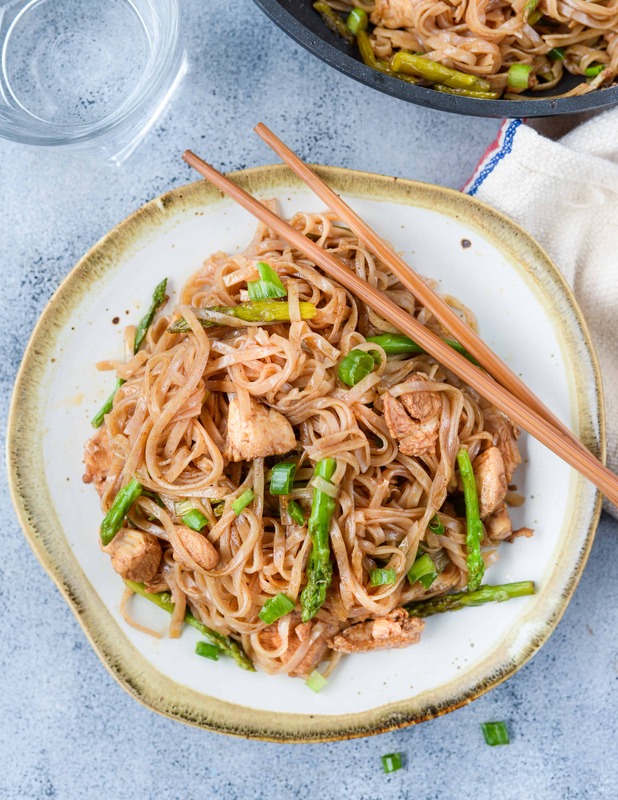 This Saucy Chicken Asparagus Stir-fry Noodle with succulent pieces of chicken and crunchy asparagus is full of Asian flavors. This 30-minute recipe is going to be a perfect weeknight dinner. Soak rice noodles in warm water for 15-20 minutes/as per package instruction. In a pan or wok heat oil. Add chicken pieces. Fry for 30 Seconds. Add minced garlic. Stir for 30 seconds. Then add asparagus followed by hot red sauce, soy sauce and brown sugar. This fish sauce is gluten free, doesn't have any added water, or preservatives. Toss everything well on high heat, until the noodles is coated well. This Low Carb Slow Cooker Mexican Chicken Soup is delicious and loaded with Mexican flavours. 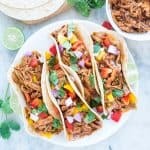 This Mexican Soup made in a crockpot has everything that you would need to comfort yourself in winter. I am so happy the way this Mexican Chicken Soup has turned out. It is low in carb and not very rich. So you can have a big bowl of this soup without any guilt. 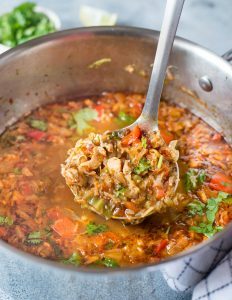 The smokey flavours of this Low Carb Soup, makes it even more delicious. The Chicken is perfectly cooked because of slow cooking in a crock pot. If you are not worried about carbs, then load this soup with crunchy tortilla chips or add some charred corn. With this soup, I started my fitness routine again ( there is no connection between the two though). Do you find it difficult to get back to your routine post-vacation? Well, I do. It has been a week since I am back and I am finding it hard to get back to my regular routine. I started feeling terrible and low. I got back to my binge eating habits. Everything was a mess and I was desperately trying to set everything right. For some or other reason I was not able to start my workout. Finally, I am back to my healthy eating. No sugar, Low carb, High Protein and off course workout. I pushed myself to the edge and made it sure no excuse to should stop me from doing the workout. Believe me, I am feeling so good since then. How do you resume your lifestyle once you are back from vacation or a long break? Any pro tips ??? 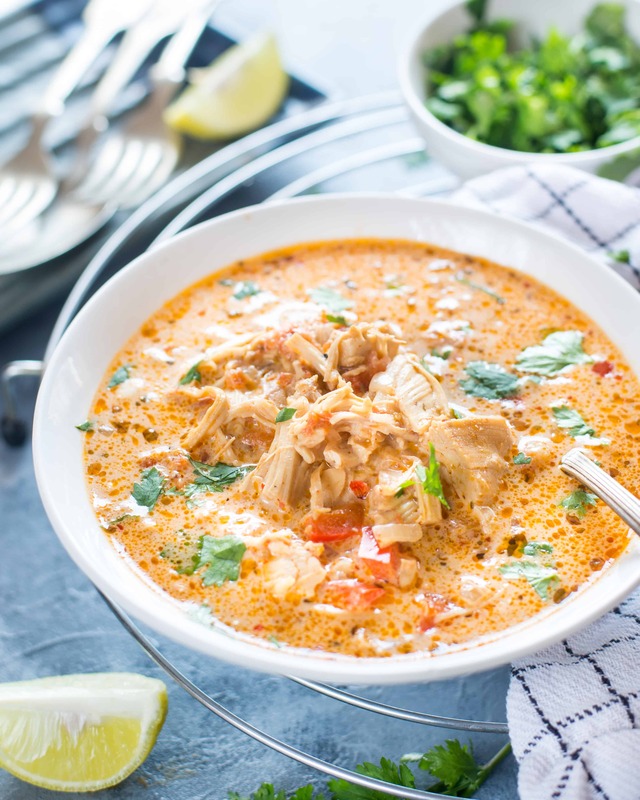 This Mexican Soup is rich and creamy. 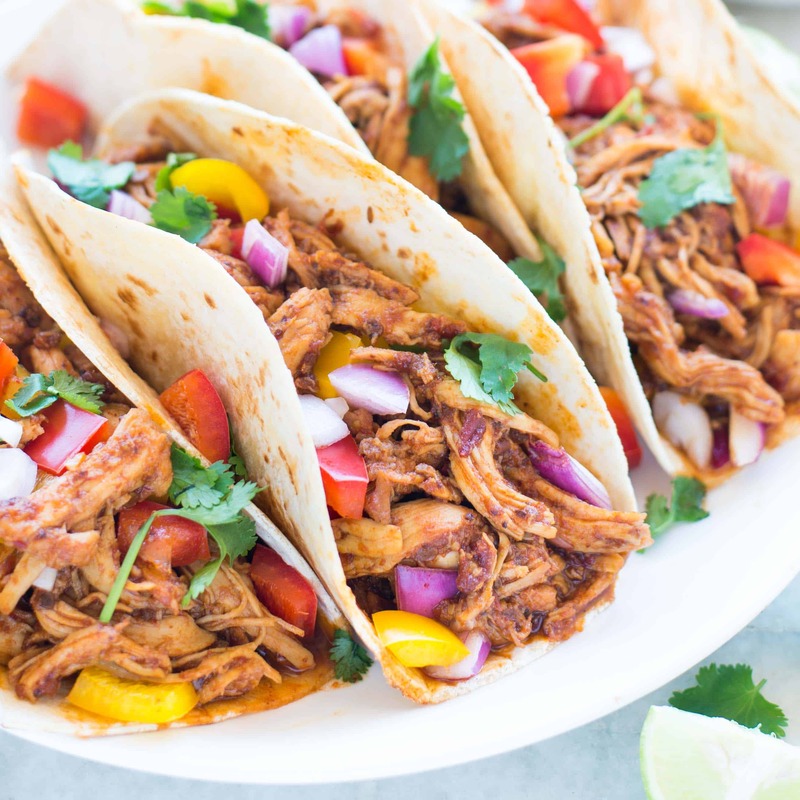 Boneless chicken breast is cooked slowly along with onion, garlic, herbs, roasted cumin powder and chipotle chilli powder in a crockpot. Because of slow cooking, the chicken breast is really juicy. It is the spice blend, Fire-roasted tomato and chipotle chilli powder are what gives this soup the real flavour. To make it rich and creamy, there is half and half, cream cheese and also lots of cheddar cheese. 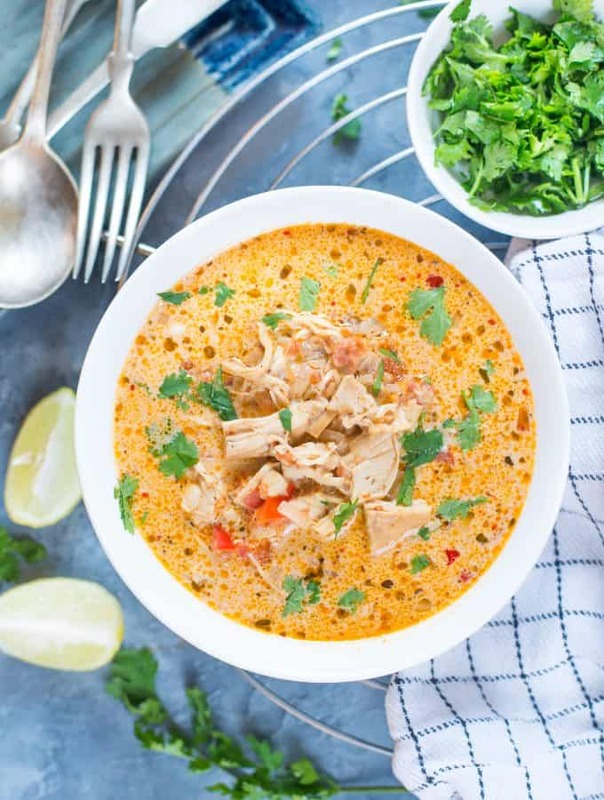 I know it sounds a lot but when it is cold outside and you are snuggling in your couch, I bet you would crave for a loaded soup. 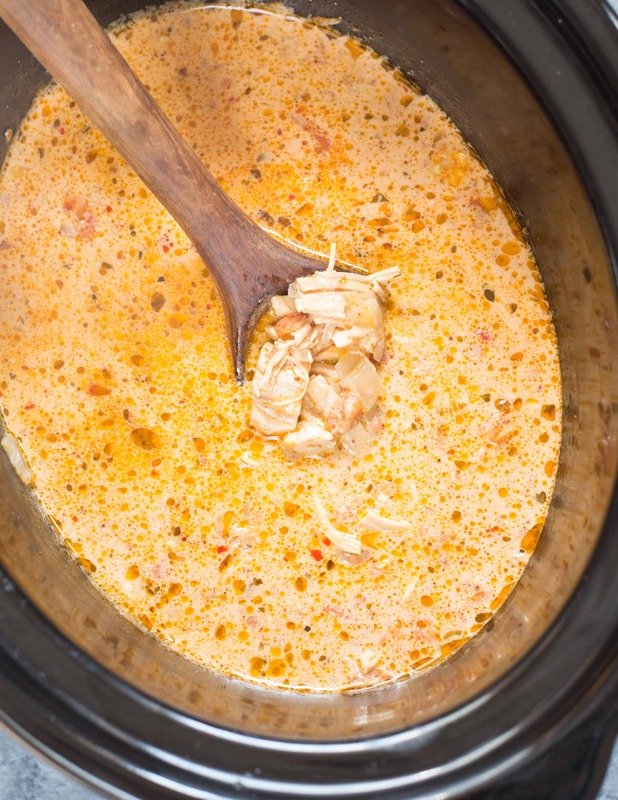 Making soup in a slow cooker is really easy and the outcome is outstanding. 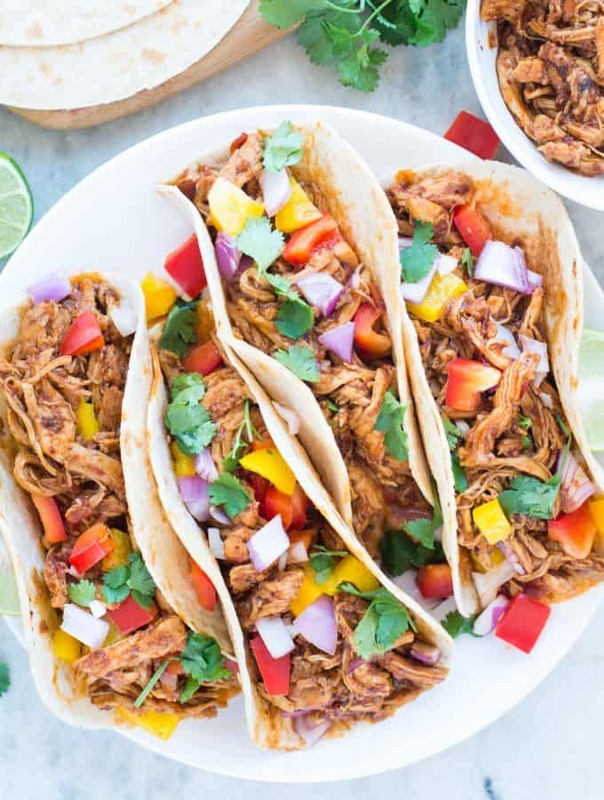 You need to spend only 10 minutes of your time and rest will be done in the slow cooker. While you can dump chicken and rest of the ingredients to the slow cooker and cook it, I would really prefer sauteing the aromatics in a pan first. Frying onion and garlic in oil gives deep flavour. Another important step while making this recipe is adding dairy products at the end of the cooking. So that dairy is not overcooked with other spices and curdles or give a wired taste. 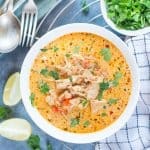 IS THIS SOUP LOW CARB/ KETO? This soup is Low carb. If you are following Keto, then you can easily adjust the recipe as per your macro. I am going to add some crunchy tortilla chips on my cheat day. 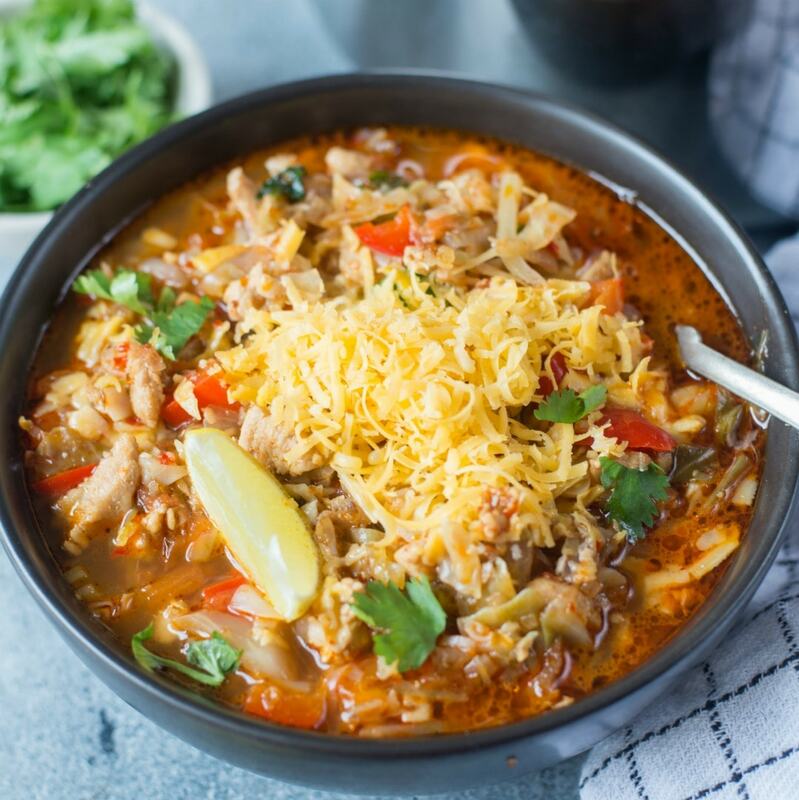 This Low Carb Slow Cooker Mexican Chicken Soup is full of Mexican flavors. 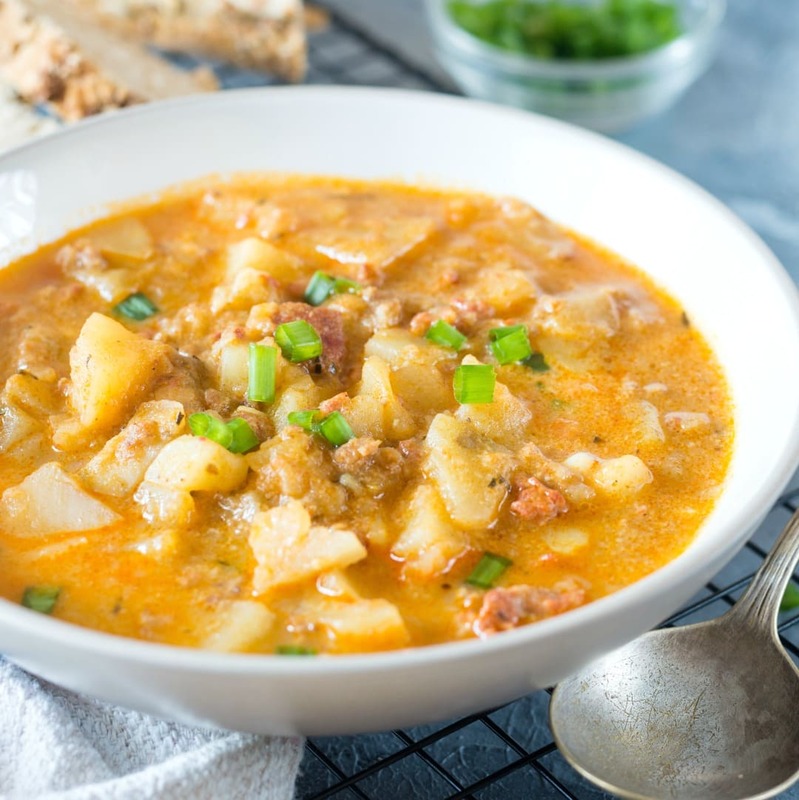 This delicious soup has everything that you would need to comfort yourself in winter. Take oil in a pan. Once hot, put minced garlic, followed by onion. Fry till Onion start to brown a little bit. 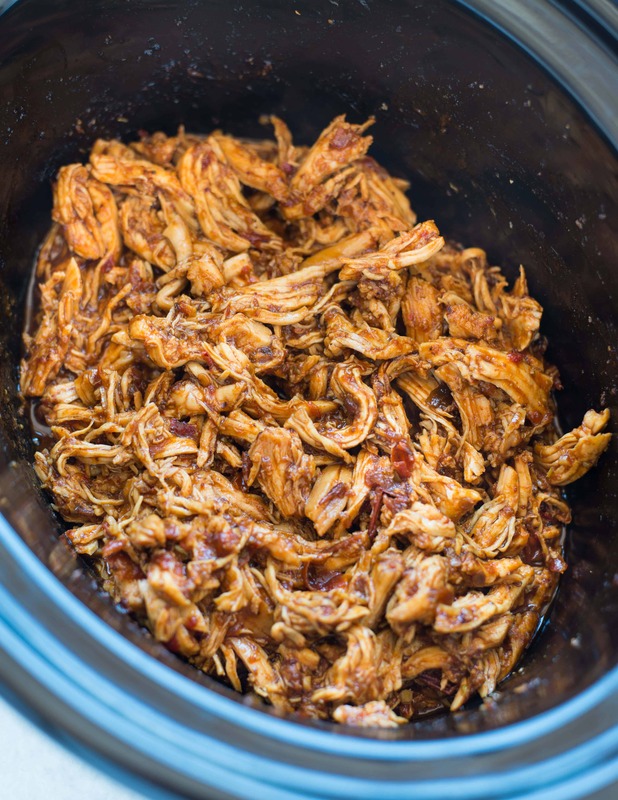 To a pre-heated Slow cooker, add chicken breast, crushed tomatoes, cooked Onion and garlic mixture, all the spices, warm Chicken Stock and salt. Cover and let it cook on high 2-3 hours. At the end of cooking using two forks shred the chicken breast. To the Crock Pot, stir in chopped bell peppers, Cream, cream cheese, Shredded cheese. Further cook on high for 20-30 minutes. While serving, top it with fresh cilantro, Sour cream, Avocados. Caramelizing Onion and Garlic is an optional step. 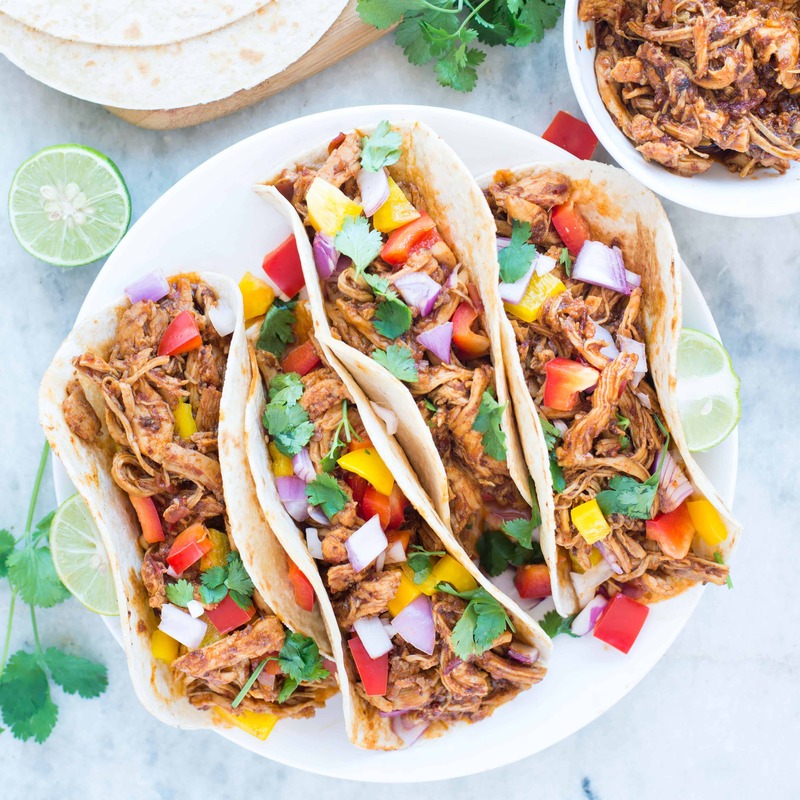 You can directly dump everything into the slow cooker. I prefer to do it because It maximizes the flavor. I roasted 4-5 medium tomatoes on the stove top. Chopped with a knife and reserved the juices. You can also substitute with equivalent canned tomatoes. If you prefer the soup more water like, then increase the stock quantity.